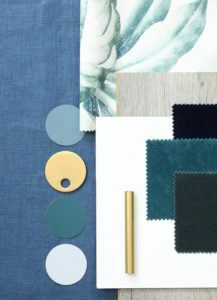 Any designer will tell you, it's the quality of materials that make an interiors scheme. 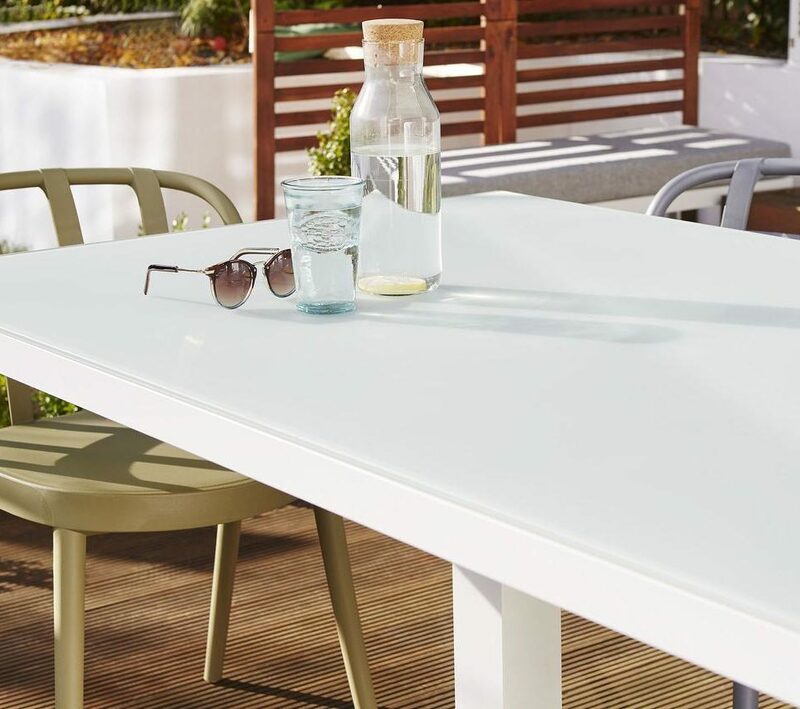 Whether a simple design, quirky, classic or contemporary, the surface details must be of the highest finish for the overall effect to look well considered. 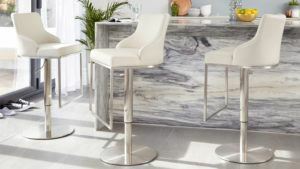 This year, the vibe is all about combining luxurious materials such as marble, polished glass and unpolished natural wood with eye-catching, matt metals. 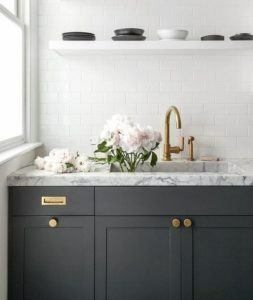 Both brushed steel and matt brass/gold are big news and dominate kitchen trends for 2018. The subtlety of the matt metallic finish exudes an understated elegance whilst the reflective qualities of the metals lift and brighten the look. It's a perfect combination and this palette ensures a room will look both stylish and welcoming. 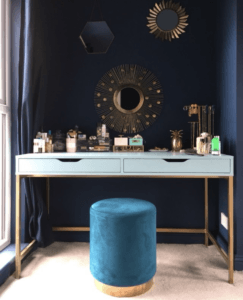 When planning a room update, detail is key and my top tip is to think about what will draw your eye in the room. 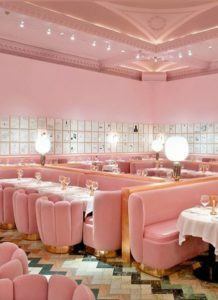 Any strong colour or heavy pattern will attract attention first. So to achieve a good balance within the space, plan the material finishes with this in mind. 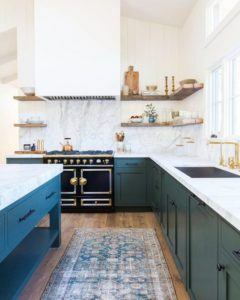 For example, a colourful backsplash can create a dramatic effect. 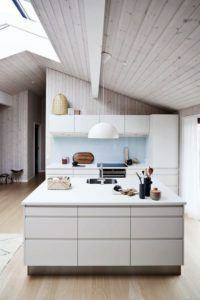 But if the colour isn’t used in other places around the room, the eye will ‘stop’ at the backsplash allowing it to dominate the scheme and create an imbalance overall. 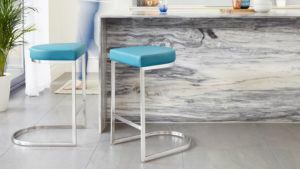 If you are planning a marble-clad island and want this to be the ‘hero’ of the design, ensure none of the other elements dilute or drown out its appeal. 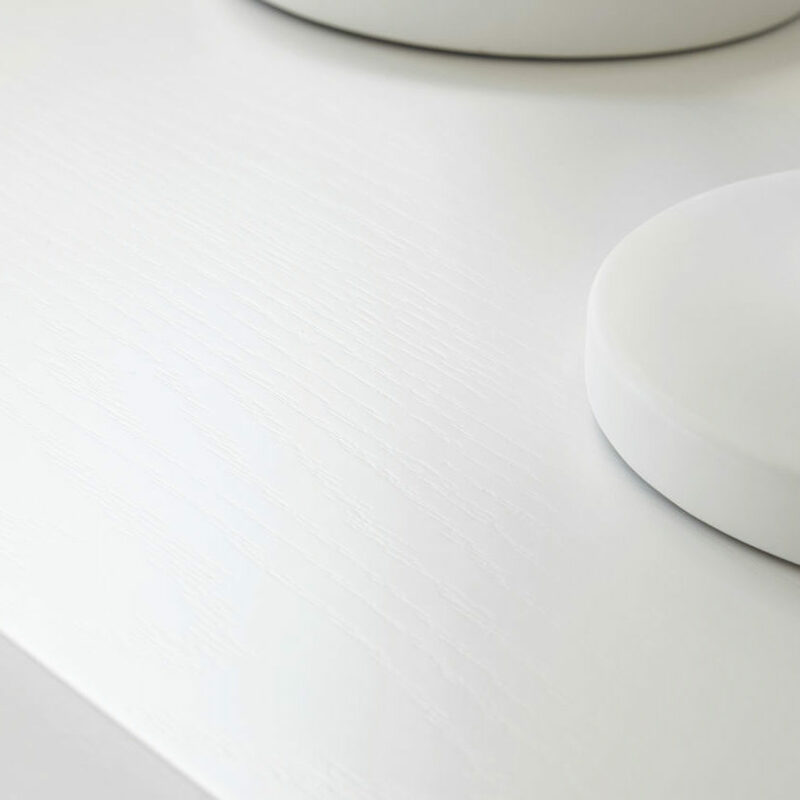 With beautiful, good quality materials, the ‘less is more’ approach wins out. 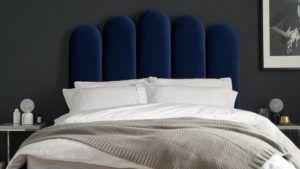 Often the best interiors, and those easiest to live with, are the simplest where each piece has both a function and contributes to the overall aesthetic. 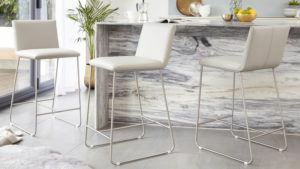 The Form Barstool has been designed with quality of finish very much in mind and the new stainless steel cantilever base perfectly complements this year’s materials palette. 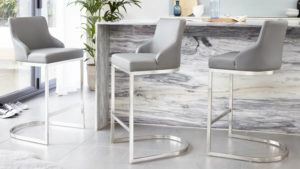 Whether set against a dark granite, timber veneer, luscious marble or glossy colour, the steel and leather-effect surface materials will stylishly enhance the look. Consider the ‘balance’ of the room, what materials will dominate and draw the eye. Are these the areas you want to draw attention to? Every surface material should complement and enhance the rest as a complete palette of tone, pattern and texture. 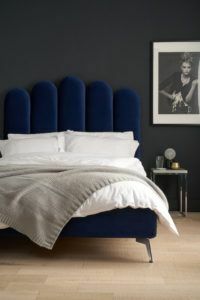 Using the ‘less is more’ approach, choose the best quality you can afford for fewer pieces to ensure a quality overall look. 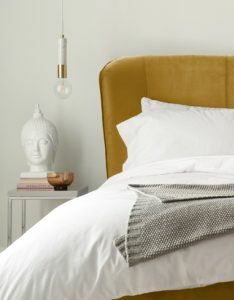 Add in matt metallics to tap into this year’s trend and add life and energy to the scheme. As with any room design, lighting is key to ensuring the fixtures and furnishings look their best. 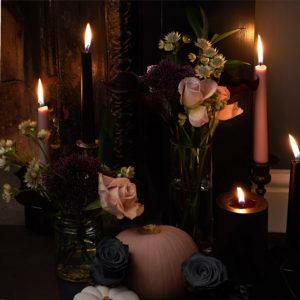 Use several circuits to produce a flexible lighting scheme for all occasions. 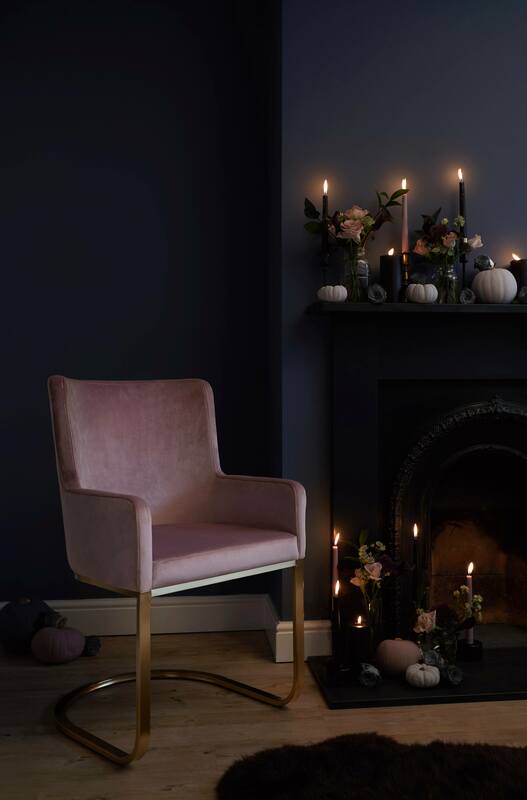 Keep your eyes peeled for new colourways and textures of our Julia Kendell Collection coming soon. To stay up to date, don't forget to sign up for our newsletter and follow us on Instagram, Facebook and Twitter for behind the scenes sneak peeks! 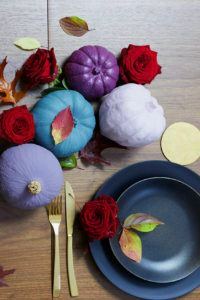 Follow Julia's new blog, The Relaxed Home, for more on her latest projects and Interior Design updates. Welcoming walnut finishes into your home is a sure fire way to make it the cosiest place to be this winter. 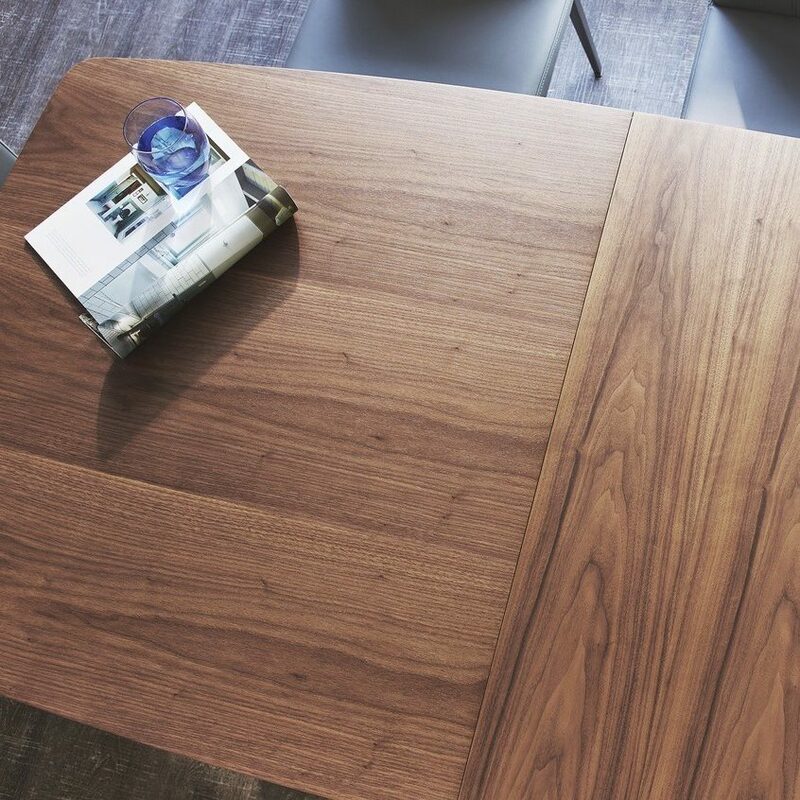 Walnut finishes instantly create such a warm, tactile and inviting feel throughout your space, not to mention adding a really premium look. 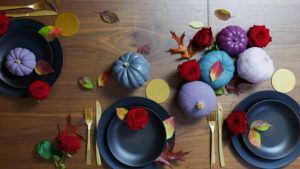 So sit back, snuggle up and relax as we show you how to create a cosy autumnal vibe throughout your home. 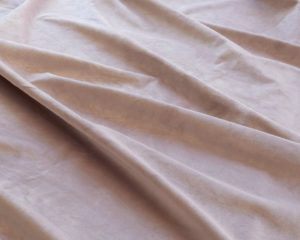 Walnut is a medium-brown finish that’s not too light or dark, yet its yellow undertones place it within a warmer colour group along with finishes such as mahogany or cherry. 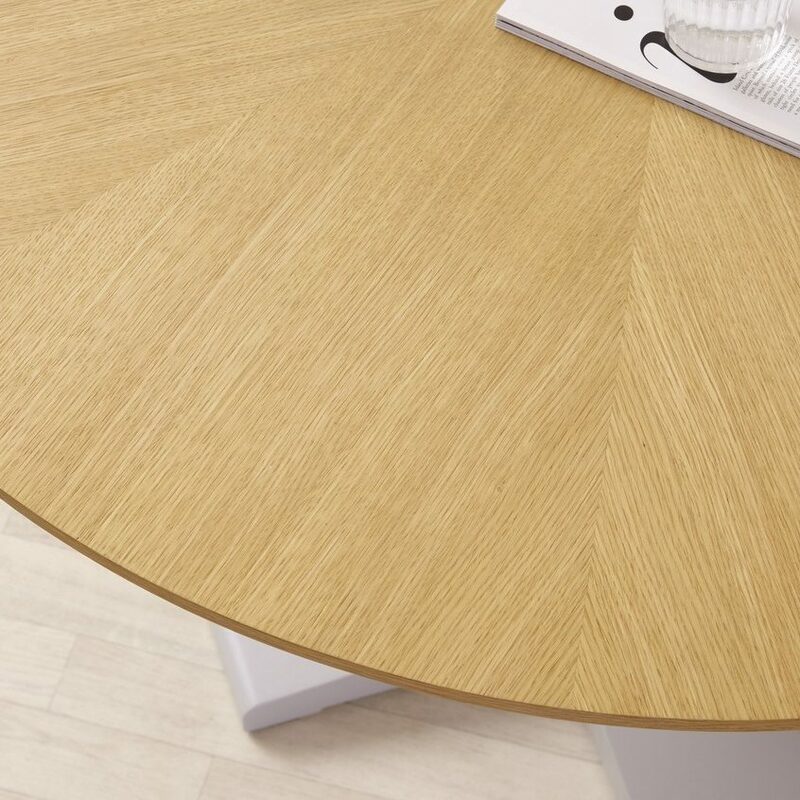 What sets walnut apart is that it’s incredibly versatile when it comes to styling with other colours and finishes. You can easily style walnut with light or dark paint colours and furniture pieces, depending on whether you’re after a bright or cosier look. 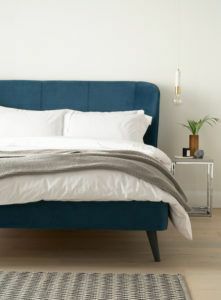 Styling walnut with green, grey and blue shades will keep the look connected, while lighter colours will create a stronger contrast and really make your walnut furniture stand out. Two finishes that are a match made in heaven are walnut and black chrome. 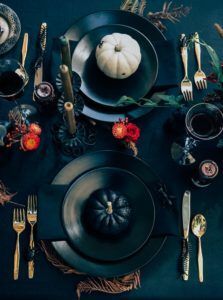 A subtler take on a regular chrome finish, black chrome further accentuates the dark luxe qualities that a walnut finish has, while also introducing a modern flair and shine. 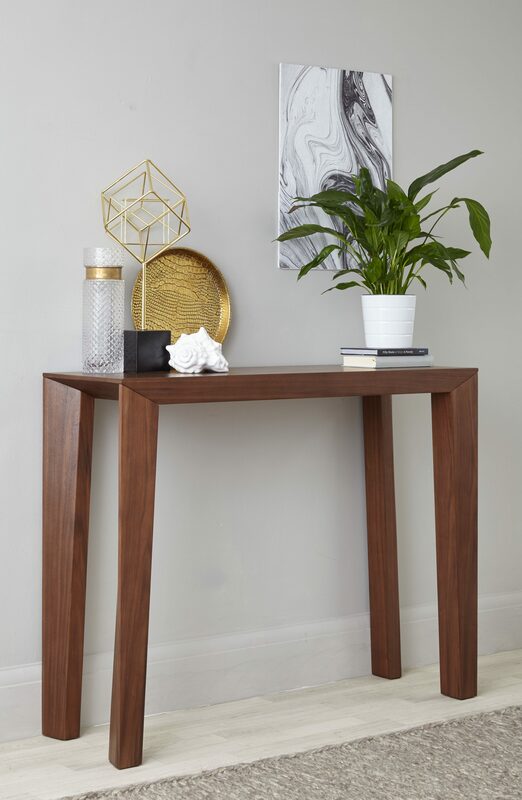 A combination of black chrome and walnut is also an easier way to introduce a black chrome finish to your space as the two materials work so seamlessly well together. 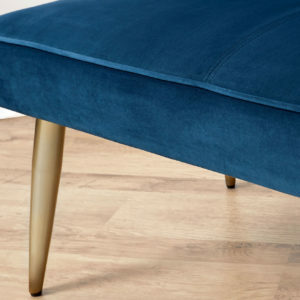 Top Tip: a fabric sofa will keep your walnut finishes looking even cosier. To keep the look light but coordinated, opt for a lighter colour fabric. Studio 2 Seater Fabric Sofa styled alongside the Acute walnut square coffee table and side table. 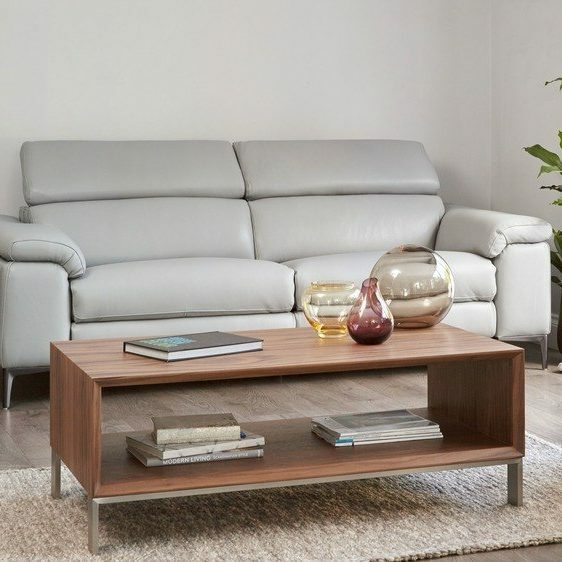 Our Acute range, which includes a side table, square coffee table and large coffee table, is a simple but really effective way to introduce this winter warmer look to your living space. With a combination of such deluxe finishes, you can really have some fun with your styling. 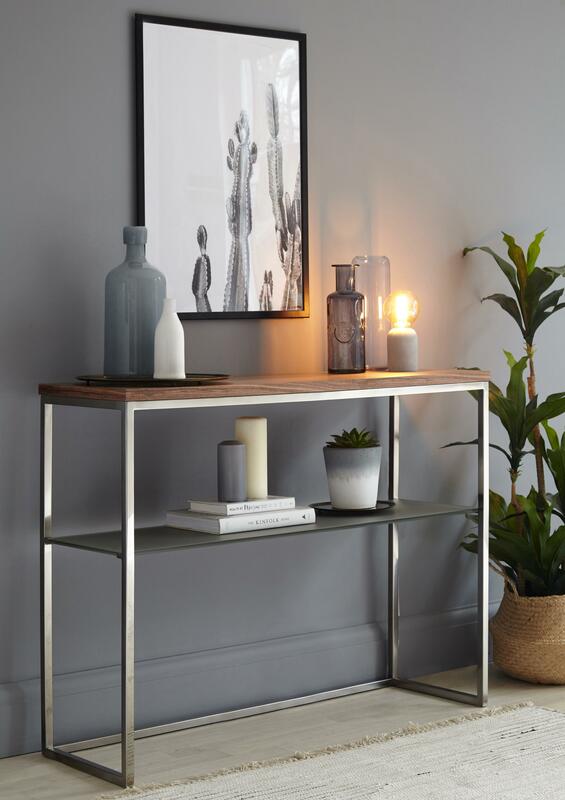 Take the Acute console table, for example. 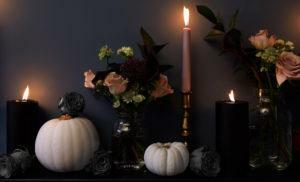 To create this moody yet cosy look, add a candle and some dark accessories. If you’re looking for a little more contrast, opt for regular chrome. 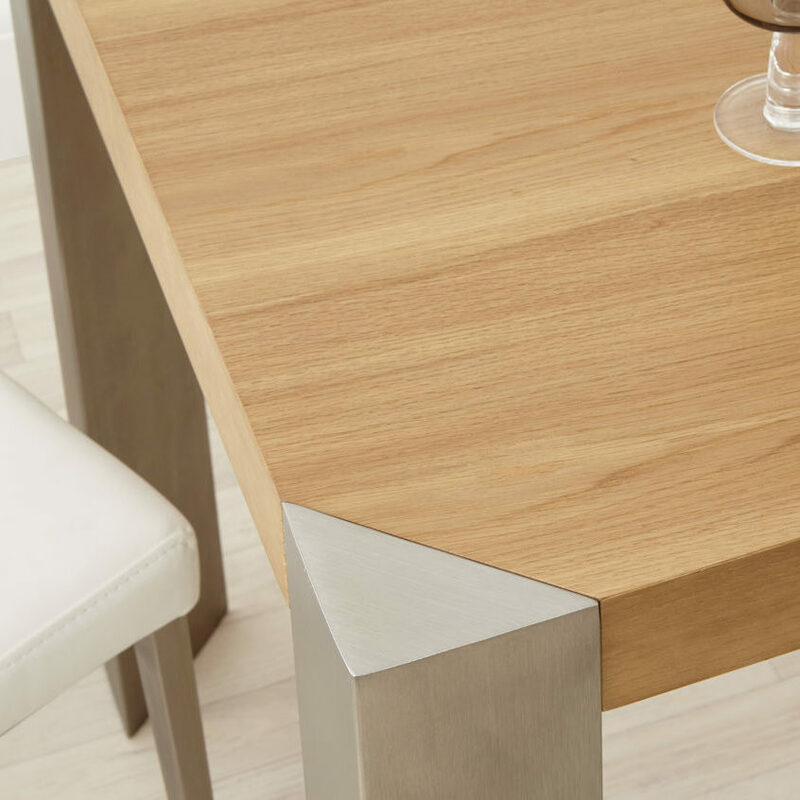 This can be done with walnut and chrome mixed material piece like the Curva dining table. 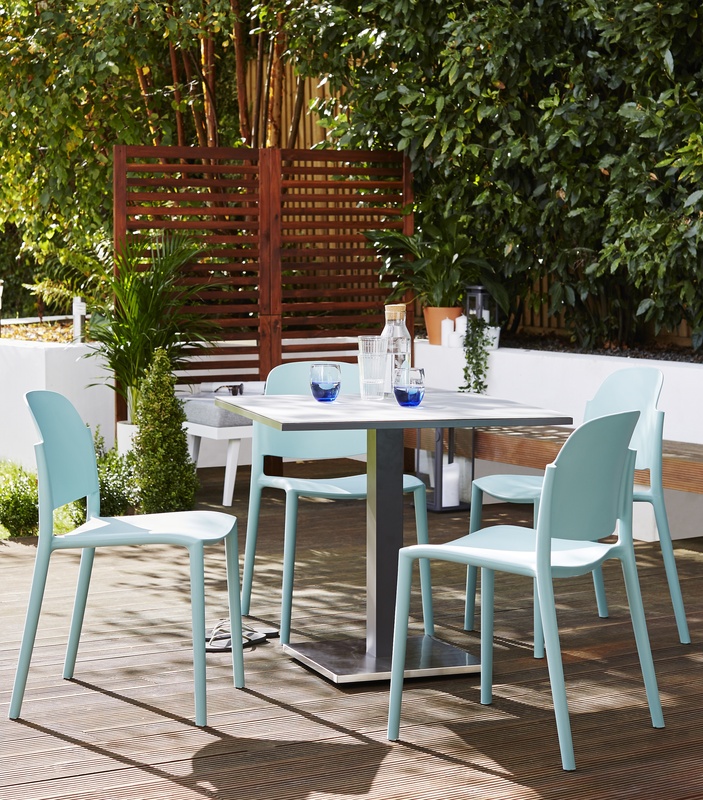 Here we’ve gone for the coordinating Curva chairs in black but if you want to lighten the look, go for a lighter colour such as white. If you’re after a slightly less shiny surface to chrome, brushed metal is about to become your new best friend! 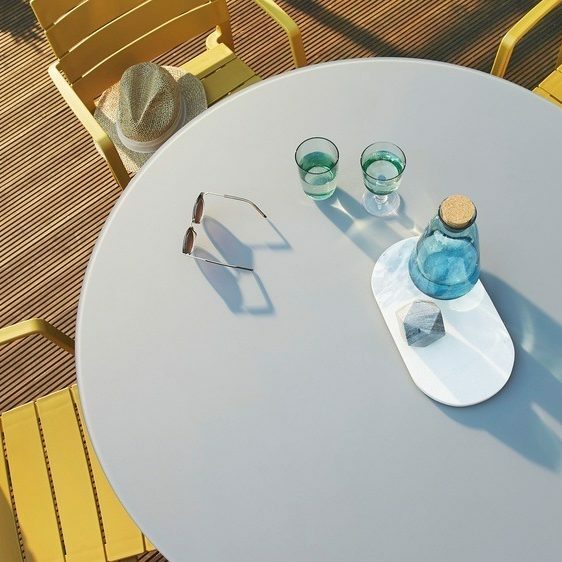 This sleek material finish has a much gentler shine than chrome. 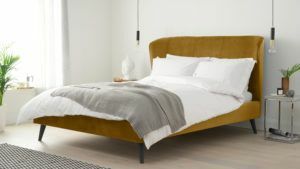 This, combined with the warm tones of the walnut, really helps to create a smooth and cohesive look. 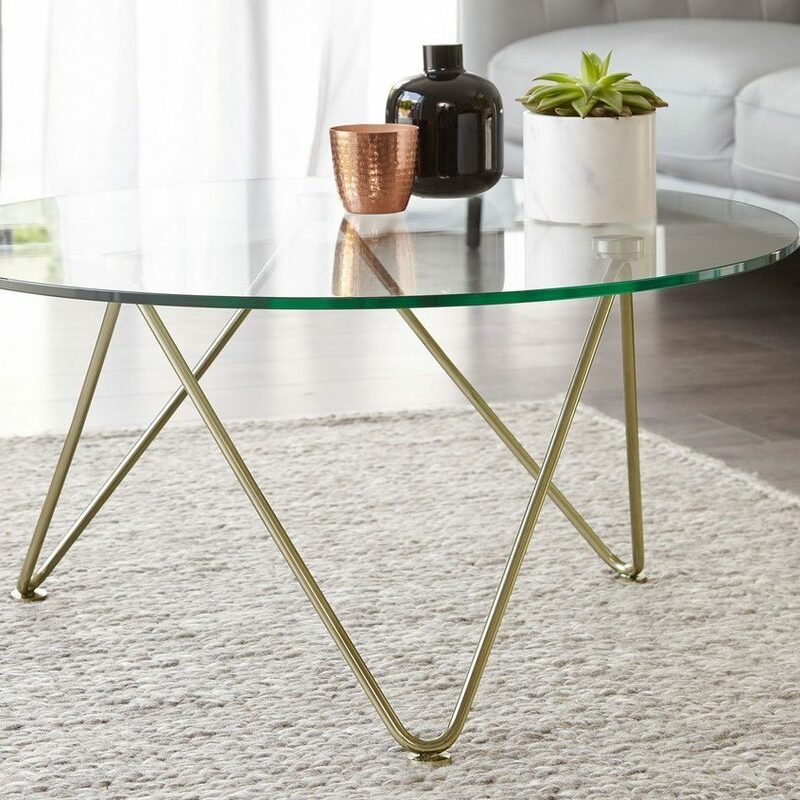 Another great thing about brushed metal is that you can introduce this as part of your walnut furniture, such as the legs of the Halo coffee table. 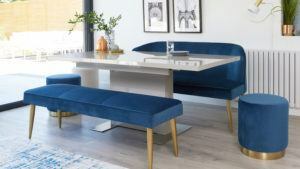 Alternatively, you can coordinate your walnut pieces with other brushed metal elements in your space, from dining tables and chairs to your sofa feet and curtain rails. 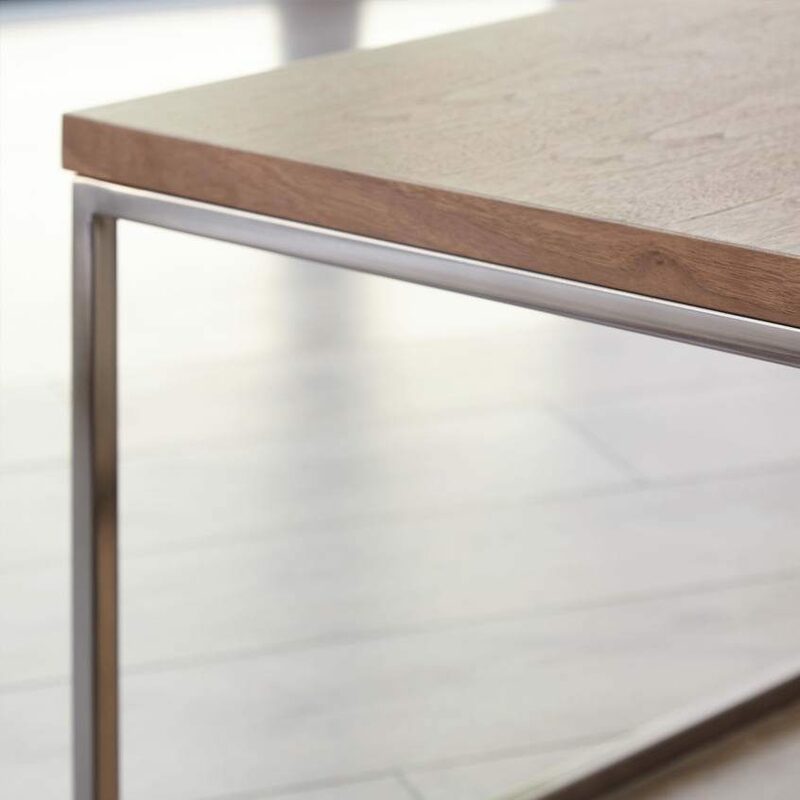 Place a rung under the Halo Walnut Coffee Table for an added look and of warmth and texture. 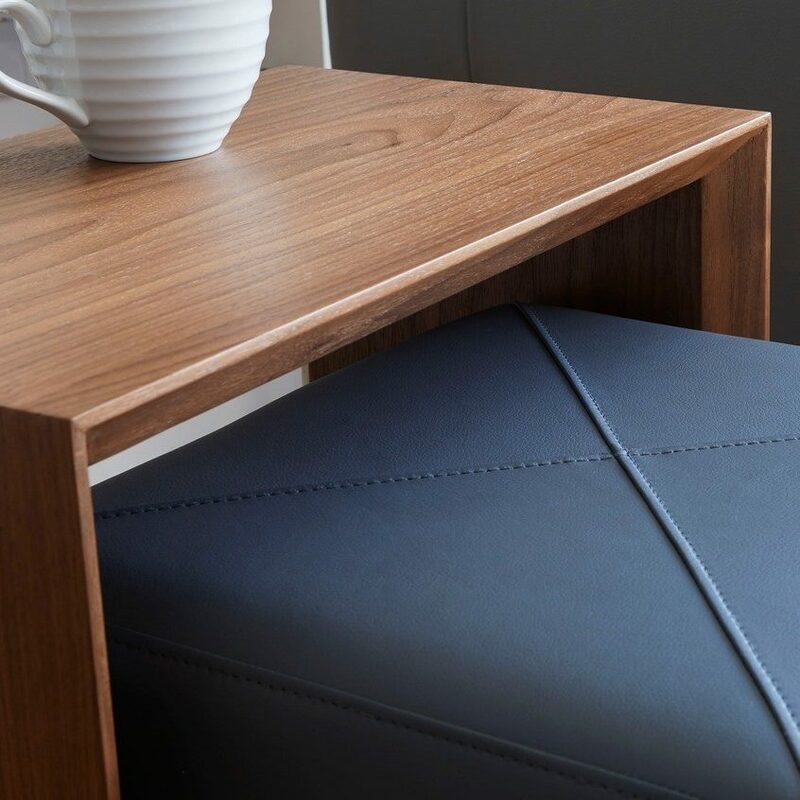 A great way to create a really cosy feel is to combine your walnut finishes with smooth leather pieces. 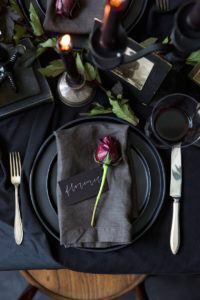 The variation of textures will again break up the look but if you opt for cooler shades like stone or charcoal grey, the colours and textures will seamlessly blend together. 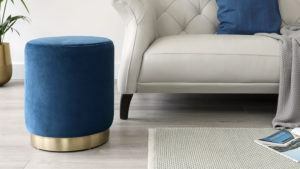 To achieve this look, you can opt for a smaller piece that combines the finishes, such as the Duo Walnut Side Table and Graphite Grey Stool Set. 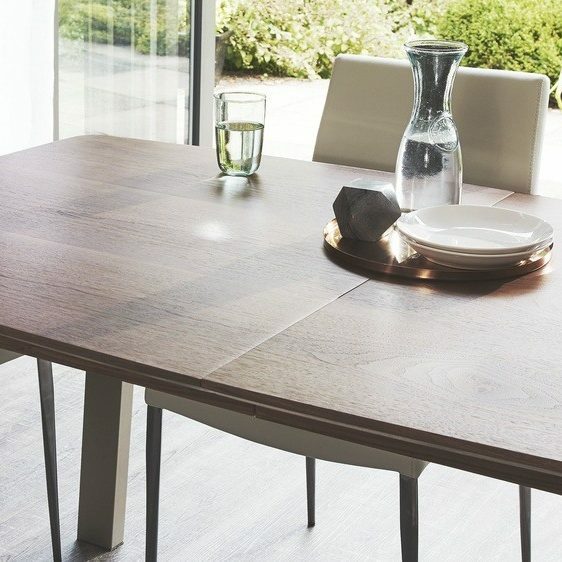 If you’re looking to create a real style statement in your space, go for something larger like the Assi Walnut Extending and Deco Dining Set. 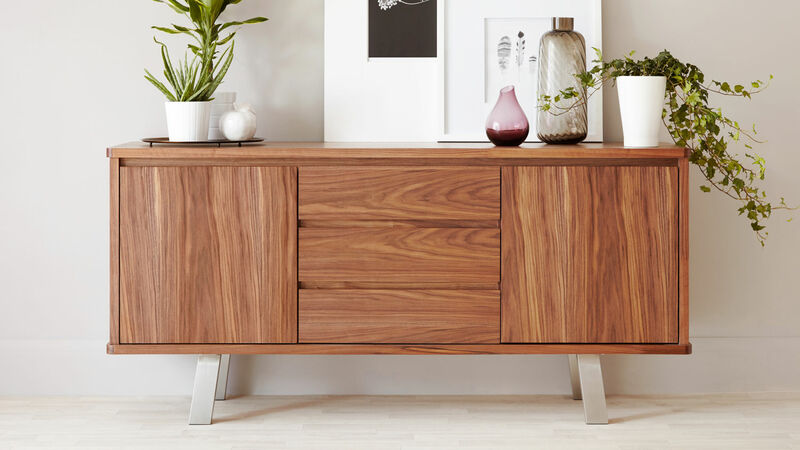 If you’re looking to carry a walnut theme throughout your home, opt for both! 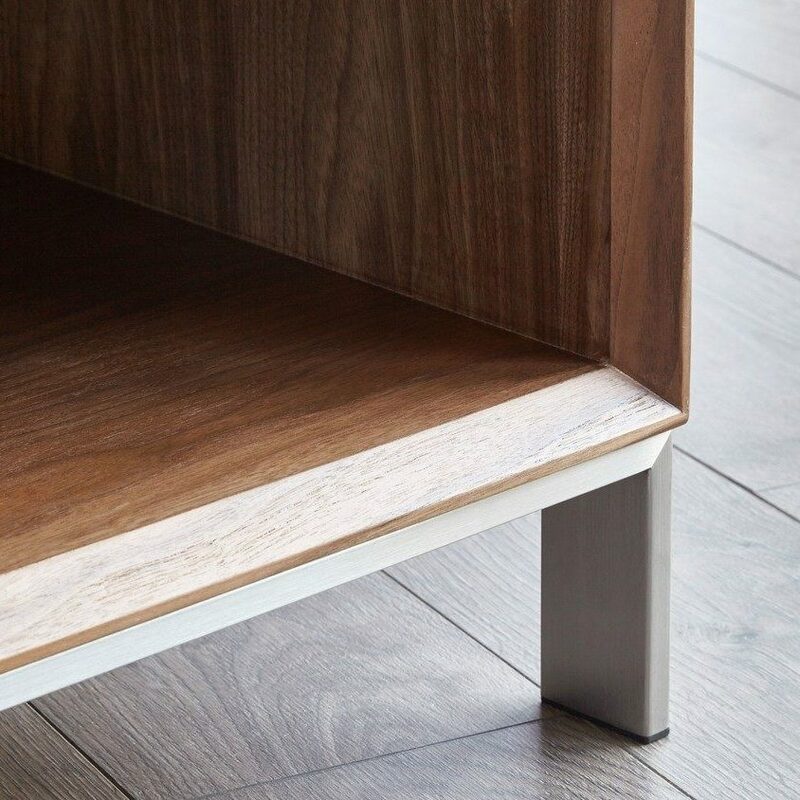 Styling your walnut finishes with a glass or glossy surface will keep your room feeling rich and tactile but will help to lighten the overall look. The contrast of finishes will break up the scheme while also stopping your interior looking too dark. 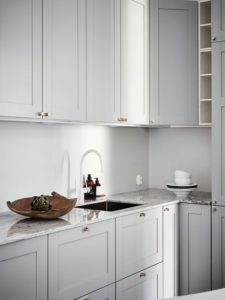 This might be a factor to consider if you already have a lot of darker finishes and want to introduce walnut into your space. 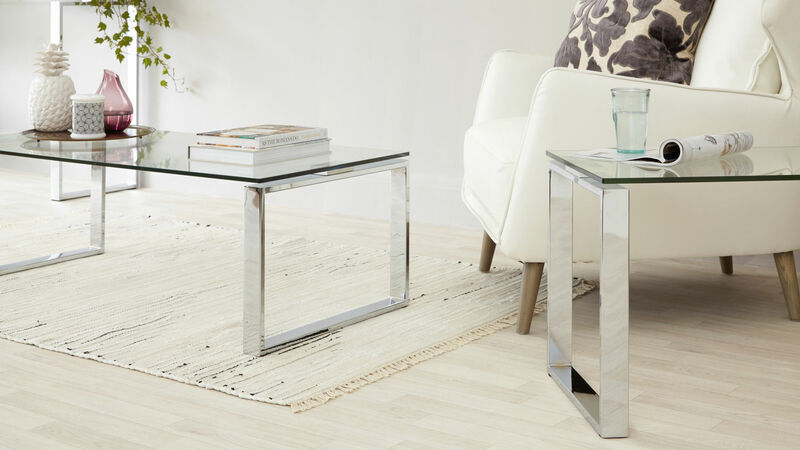 You can achieve this look by choosing a piece that is a mix of materials, such as the Assi White Gloss and Walnut Sideboard, or choose a glass item that will complement your interior while not being too visually impactful, like the Ripple Glass and Gold Coffee Table. 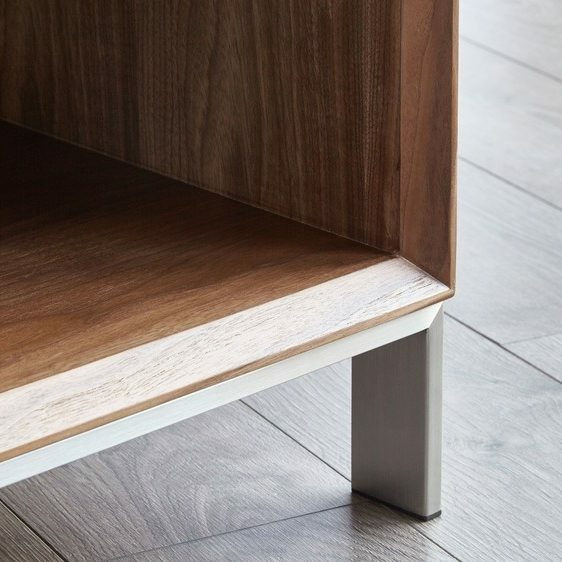 So there you have it, a whole variety of ways to introduce walnut in your home. 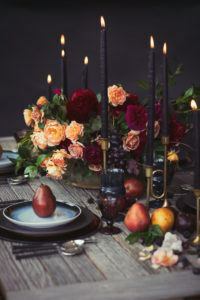 Have we inspired you to create this winter warmer look in your home? Let us know in the comments! 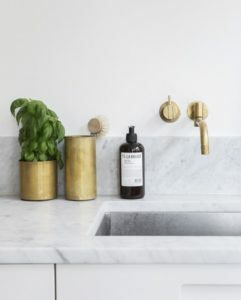 And for even more inspiration on how to style this on-trend finish in your home, be sure to take a look at our walnut Pinterest board which is packed full of design ideas. Already have some walnut Danetti pieces in your home? 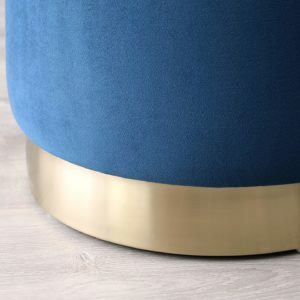 We’d love to see how you’ve styled this rich finish in your space. For your chance to be featured on our page, simply post a picture on Facebook or Instagram with #mydanetti. Buying your first home or moving house is such an exciting, albeit stressful, milestone in life. 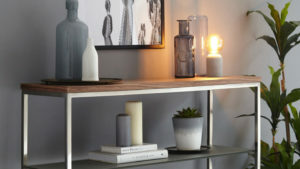 A new home usually means a new location, a fresh start and, what we’re most interested in, some new stylish furniture. Having to furnish a new build home can seem a little overwhelming. This is because there is likely to be a lot of space you’ll need to fill. So whether you’re starting from scratch, downsizing, or moving into a bigger space, we thought we’d offer a helping hand. 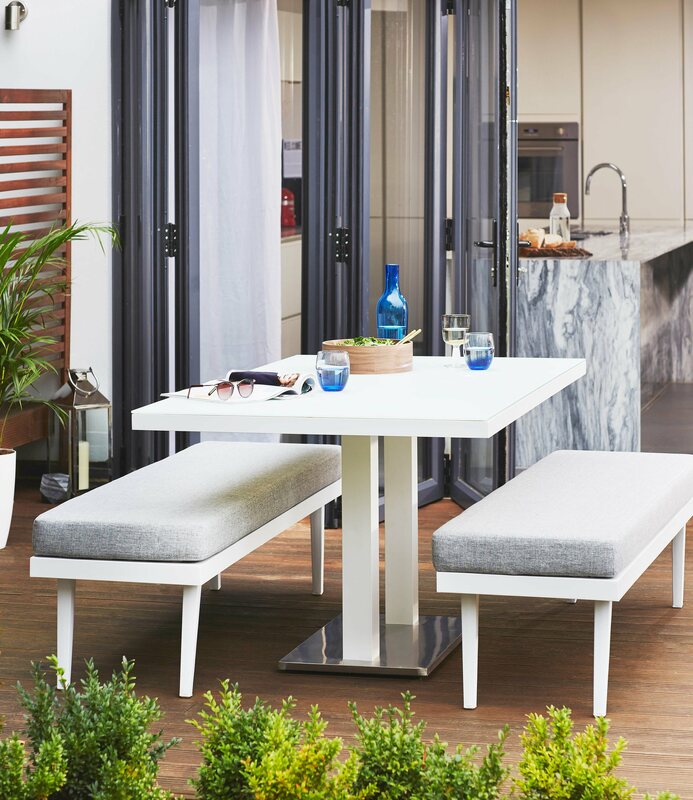 This post is packed full of our tips and tricks to help you furnish a new build home. 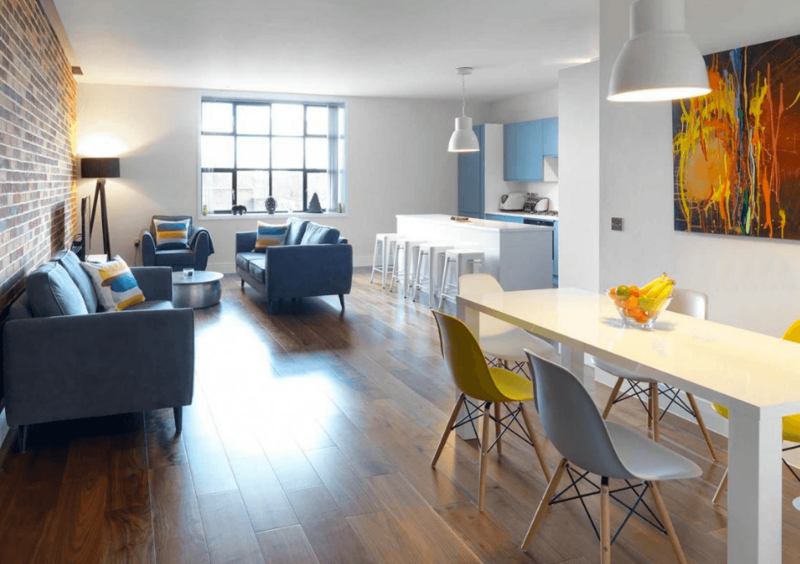 Firstly, let’s address some of the top mistakes people make furnishing a new build home. These are the ones you’ll want to avoid! Don't Overfill. 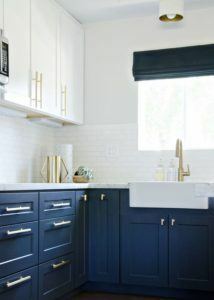 Just because you’ve got a whole new empty space to work with, doesn’t mean you have to fill, cram and coordinate every space, nook and cranny right away. Start with your investment pieces rather than buying everything in one go (we’ll talk more about this in more depth later), and then you can add any additional, non-essential pieces later on. Don't trust your eye rather than a tape measure. 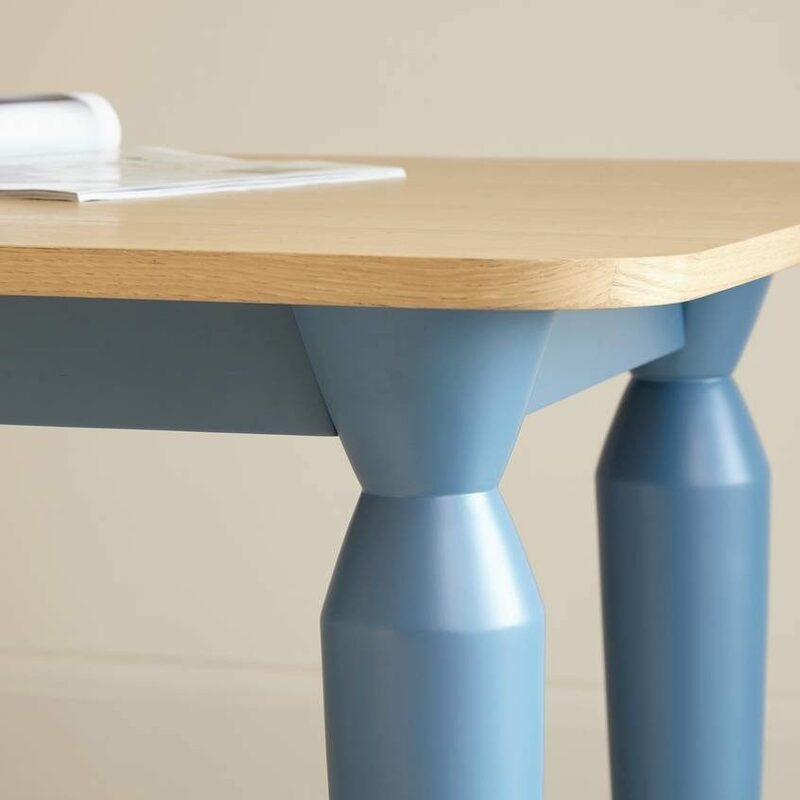 This is never a good idea when choosing your furniture, especially when buying online. 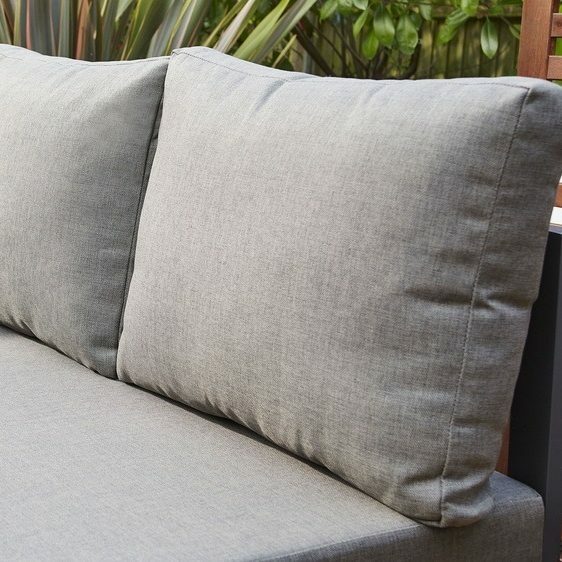 Thinking your new sofa and coffee table will fit is very different to knowing that it will, so save yourself the stress and hassle on delivery day by knowing your measurements well before you place your order. Don't be unrealistic. 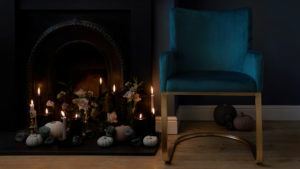 We’ve all done it; seen a gorgeous two-page spread in Elle Decor or Ideal Home, bookmarked the page and dreamed that one day our home would replicate the stylish setting. 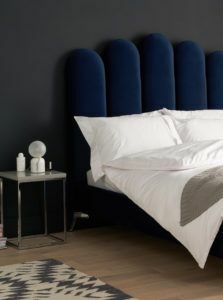 Although the imagery in the glossy magazines does look flawless, if you try to make your room look like a page in a catalogue it’ll sadly never quite live up to the expectation. That’s not to say a stunning interior setting is impossible. Keep in mind that your new build home is going to be lived in. So although you won’t want it to look messy, you’ll still want it to have a welcoming and inviting feel. 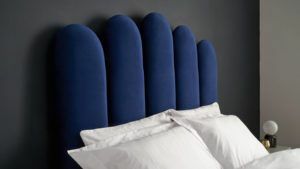 Now you know what not to do, let’s get stuck in with our 8 top tips on how to furnish a new build home. 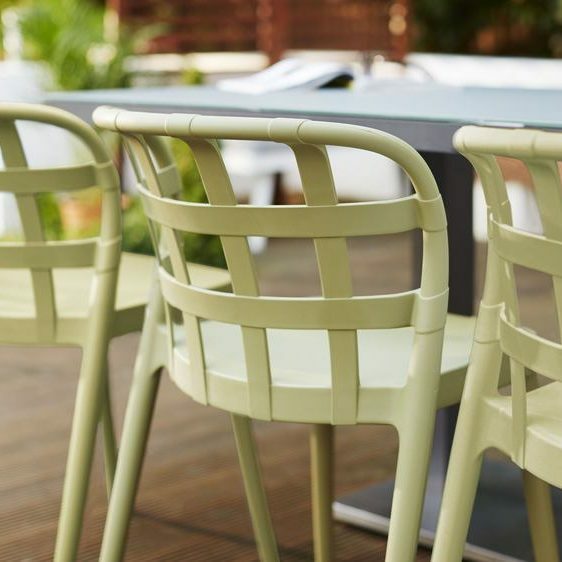 The ease and popularity of buying furniture online has dramatically increased. That's why furnishing your new home with all new furniture pieces should no longer be seen as an expensive luxury. 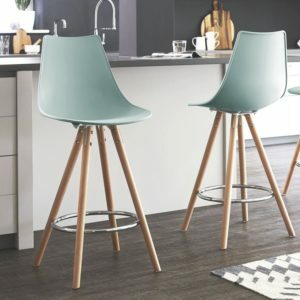 There’s so much choice online when it comes to dining room, living room and kitchen furniture. Start by focusing on one room at a time so you don't become too overwhelmed. Then you can start browsing online to see what shapes and styles catch your eye. Try to focus on one room at a time so you don't become overwhelmed by the choices available! 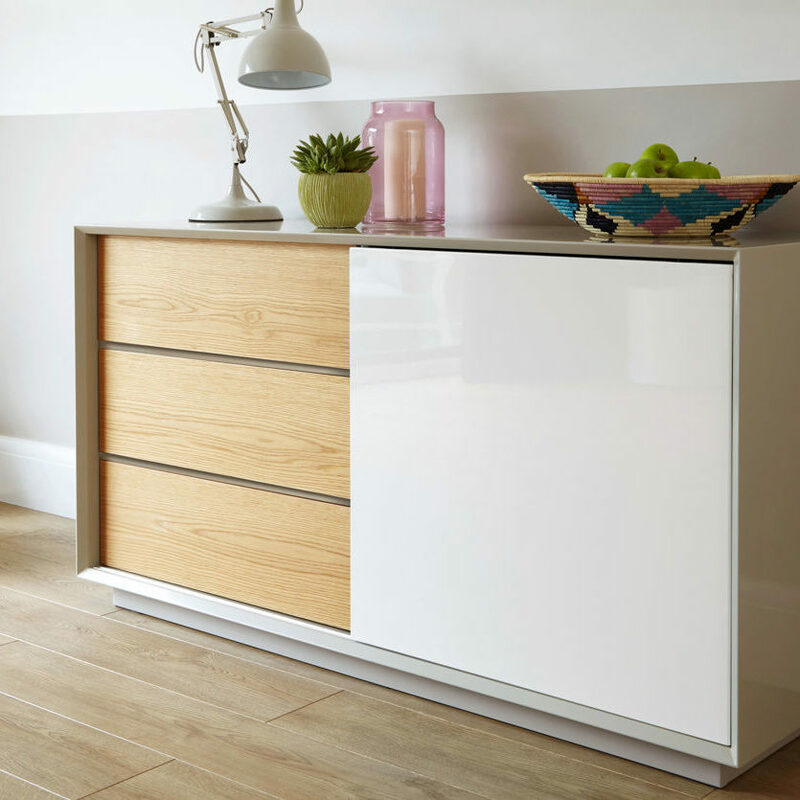 Moving house is also the ideal time to think about any additional furniture pieces that will benefit your new space. 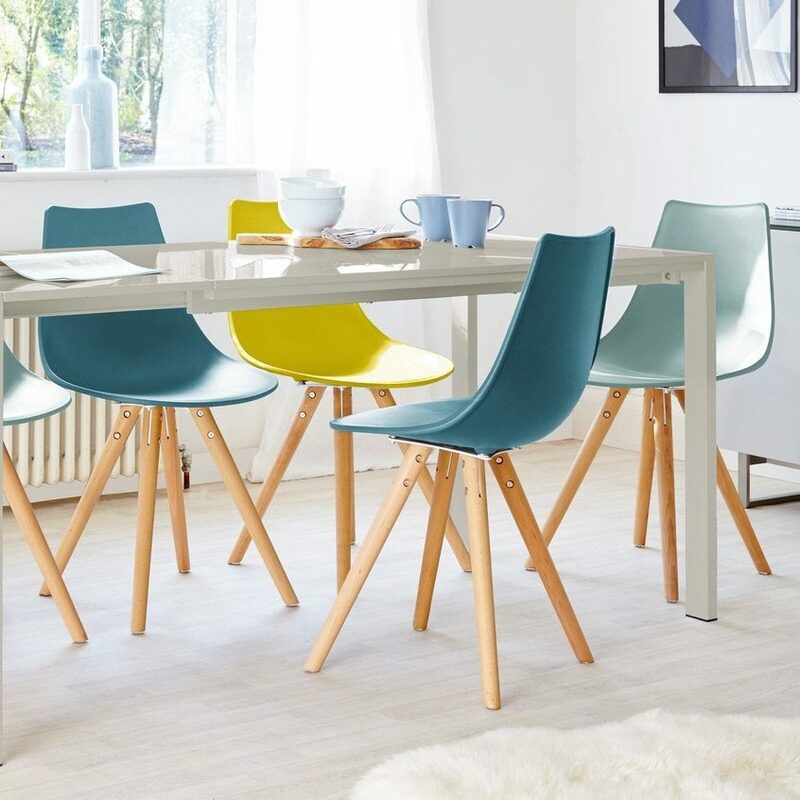 If you’ve been squeezing everyone around a small dining table, now’s the time to invest in that stylish extending dining set that can offer everyone a seat. 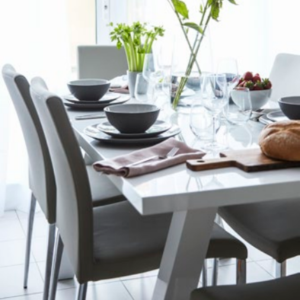 If you’ve never had a dining table of your own, there's no better time to find one that’s just right for you and your new space. TOP TIP: One great way to stay focused on one room at a time is to use Pinterest. This way, you can create a board for each room. It’s also a great way to get an idea of how the pieces you’ve selected will work alongside each other. 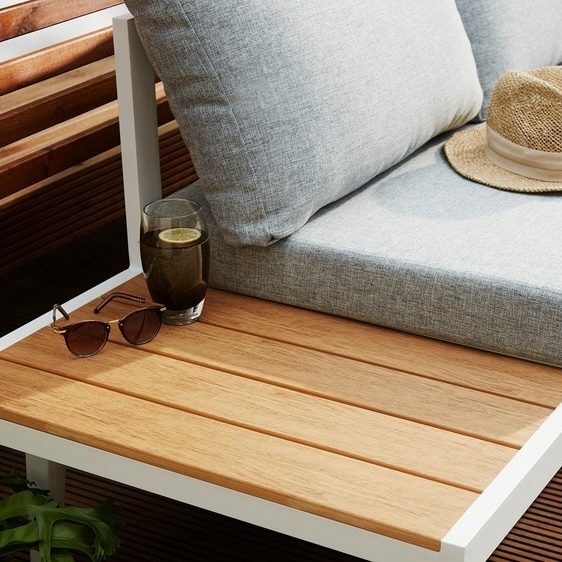 We use Pinterest all the time to create boards and offer some interior inspiration. Make sure to give us a follow so you don't miss a thing! New to Pinterest? Don’t worry! We have a handy guide for Pinterest beginners that will get you up and pinning no time. Get to know your space by measuring the area, and if you haven’t moved in just yet, make use of the estate agent’s floor plan to get a better idea of the shape and size of the rooms in your new home. 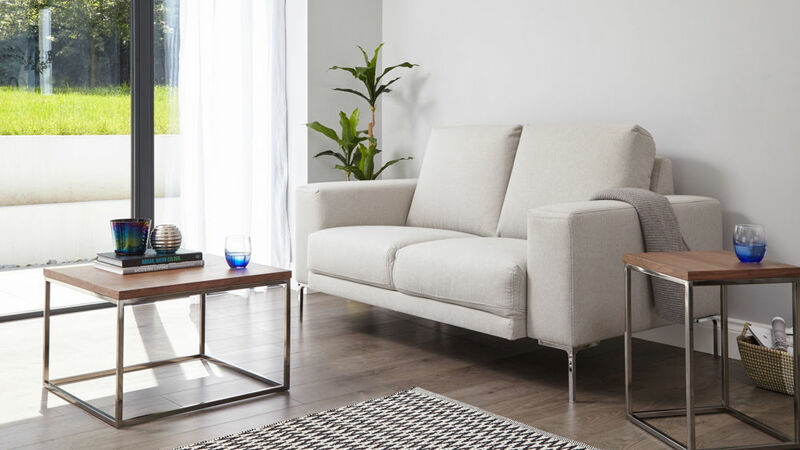 If the layout differs greatly to your current home, that’s when you’ll need to consider furniture that'll suit your space. 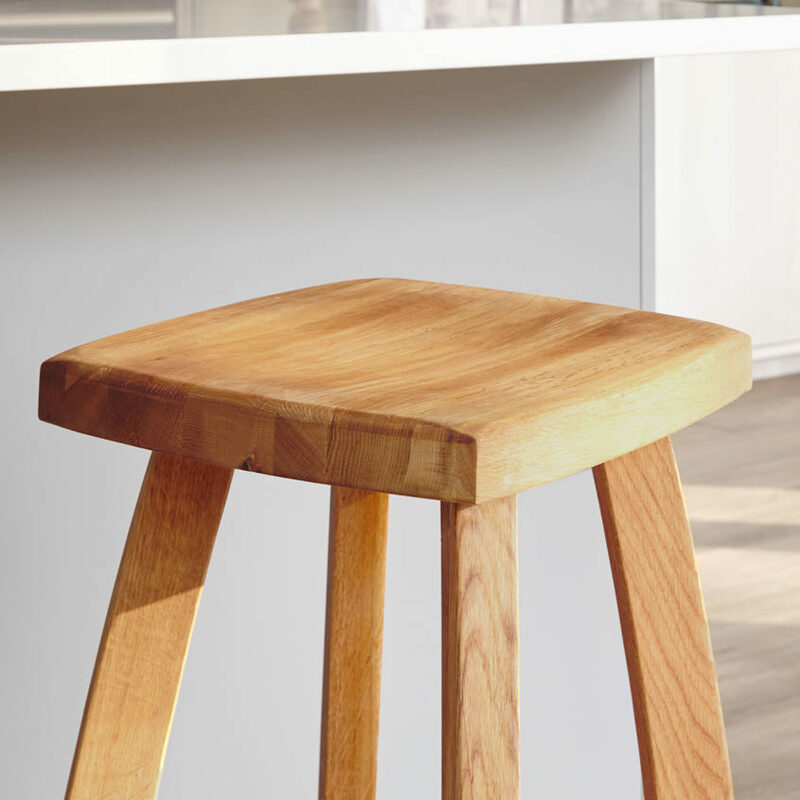 If you’ve downsized, then your current furniture might no longer fit. And if you’re starting fresh, the furniture world is your oyster! 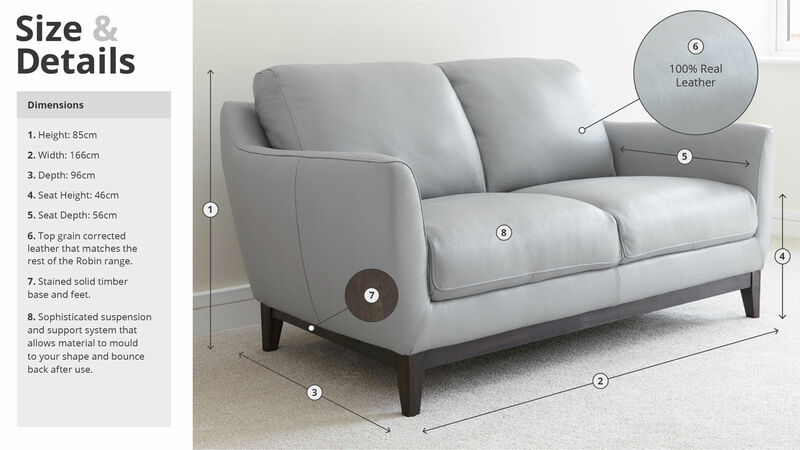 Many online retailers will list the furniture measurements on their website, and there are loads of handy sizing guides available. To get a better idea of how your furniture will fit before you move into your space, interior design apps are a great help. Apps such as Planner 5D can be easily downloaded to your iPhone (for free!). You can then size and scale furniture pieces along with the size of the room. This will help you get a feel for how things will look. 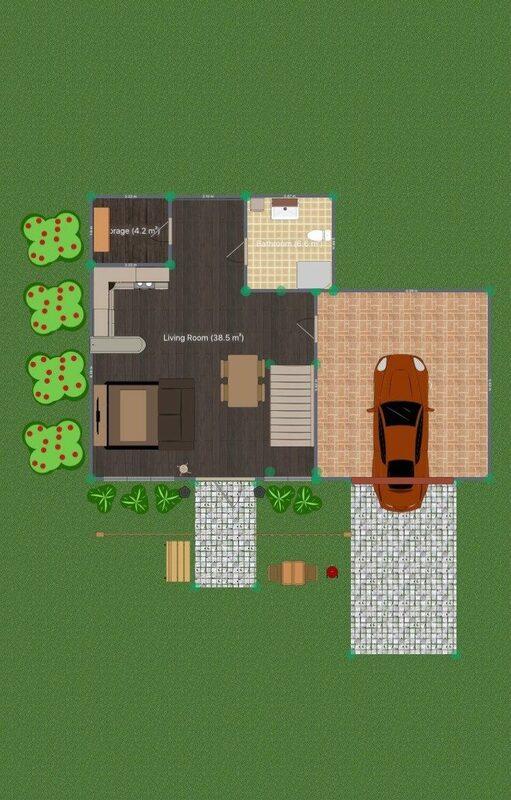 The 2D view is great for creating floor plans and seeing how much space you have to work with. 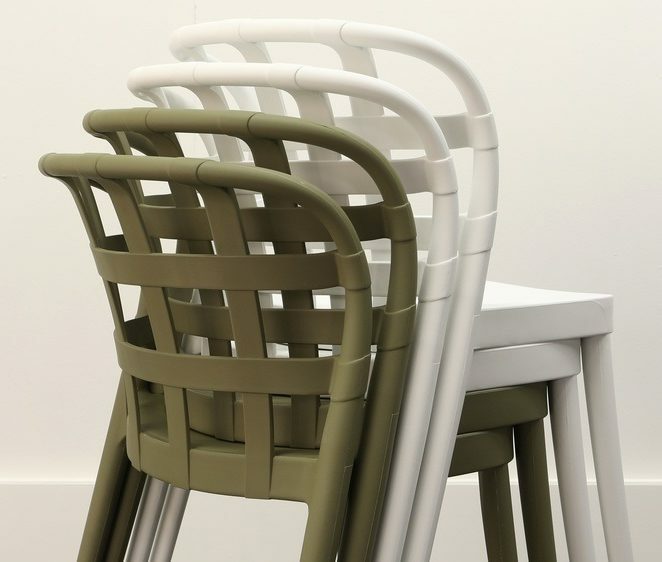 The 3D view is where you can try out different colours and styles of furniture pieces. There's a whole host of interior apps that will help you each step of the way of your new home journey. Want to know the best ones? 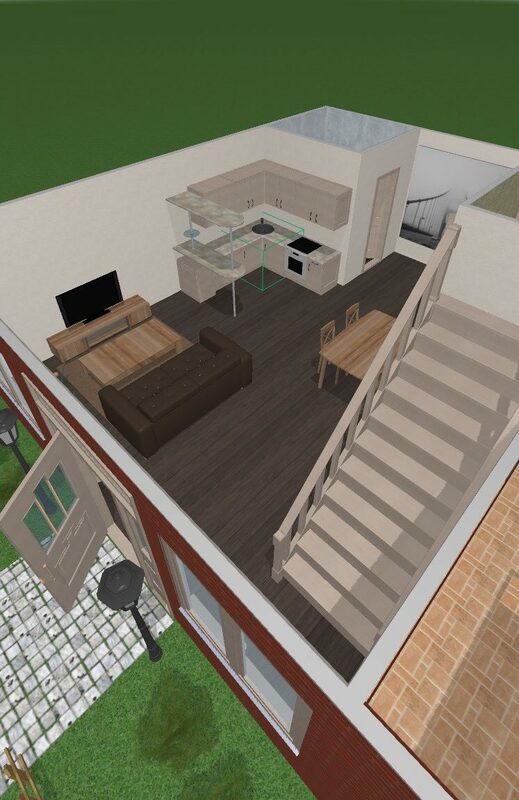 Take a look at our Top 6 Must Have Interior Design Apps. So you have your dream house, you know which room is which and you’ve measured everything (including the door frames). Armed with everything you need, it can be tempting to go ahead and buy everything at once. 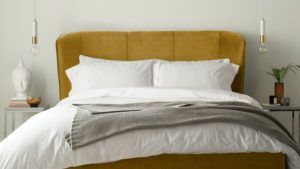 However, this is one furniture buying mistake to avoid when furnishing your new home. Buying everything at once is a huge cost in one go. It will also take away your styling focus from each room. This is beacuse you’re looking at multiple pieces and styles throughout your home. 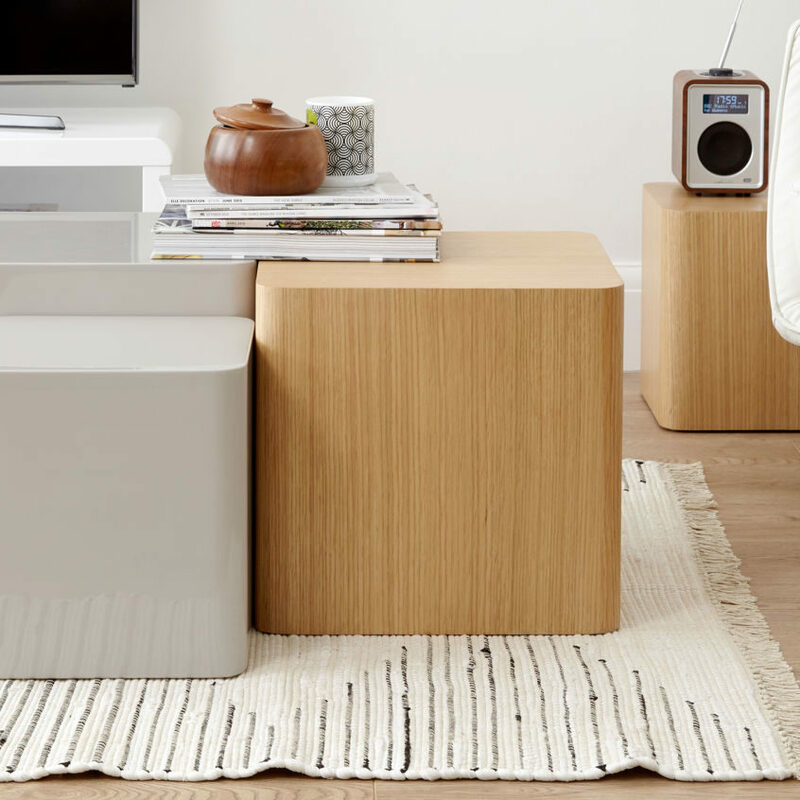 Starting with your staple pieces is a great way to start filling your new room. You can add any additional pieces when you have a better idea of the space and style you have to work with. 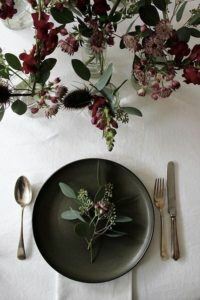 Not buying everything at once doesn't mean you have to spend the first few months sat eating your dinner on the floor, however. 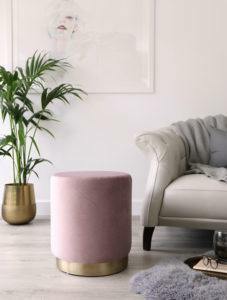 Focus on your staple and investment pieces first, then all of the sleek accessories can be added later to give your room an even more homely touch. TOP TIP: One way to make sure you stick to the essentials is to make a note of your budget- and stick to it! 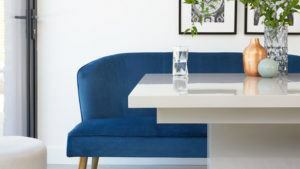 Moving home can be an expensive time, so it’s a good idea to know how much money you have to actually spend on furniture before you set your heart on a sofa and dining set that is way out of your budget. Once you know what you’ve got to work with, then you can start shopping around. If you have any leftover cash, you can then buy those extra pieces on your wish list without any guilt as all the important pieces have been covered. The term investment pieces can hold connotations of costing a lot of money, but try to think of your investment pieces as just that- investments, not expenses. A good quality bed, sofa and dining table will provide comfort and seating for your family for years to come. 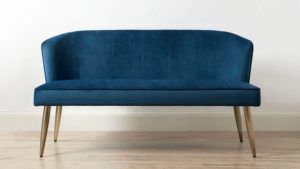 So if you can afford it, it’s a very smart move to spend more on these staple pieces for your new home. 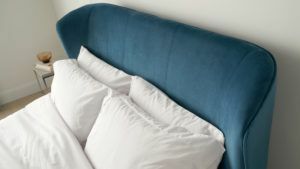 Vital parts of any home, investment pieces will be the furniture that you use the most and keep the longest, so you’ll want to choose something that’ll last. 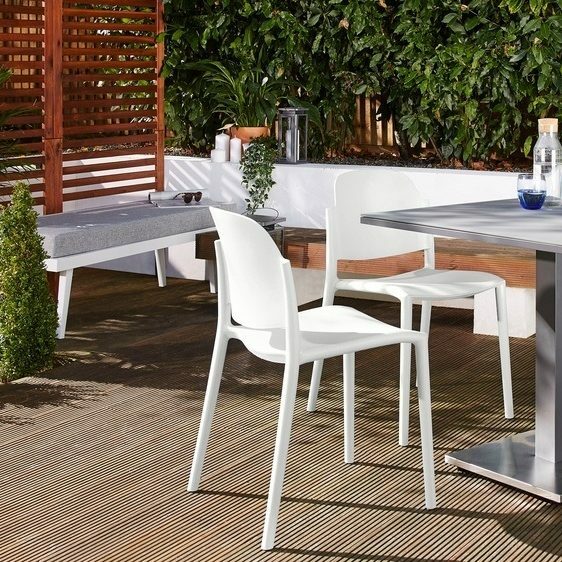 Dining sets are definitely up there with the essentials for a new home. 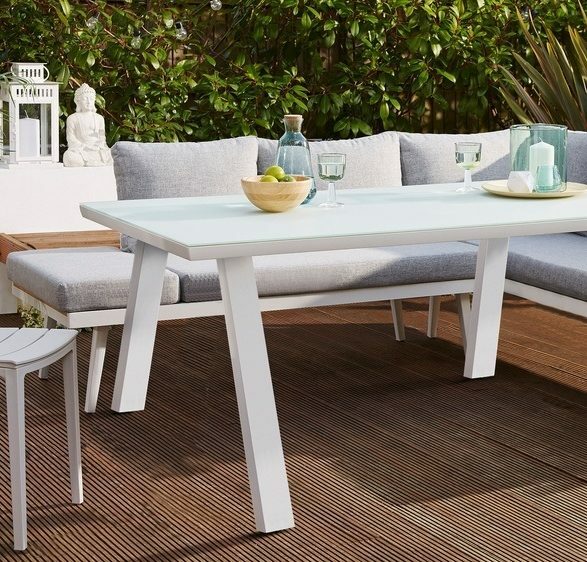 A set like the Sanza White Gloss and Loop 5 Seater Right Hand Corner Bench will offer you style, practicality and versatility all in one setting. 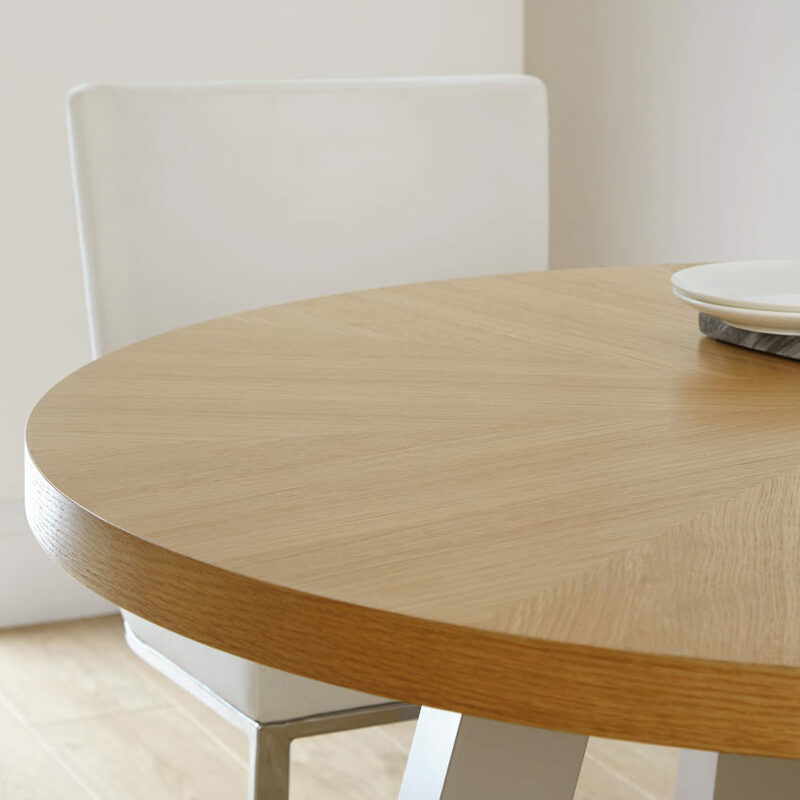 A dining set is definitely one of the investment pieces you’ll want to get right. 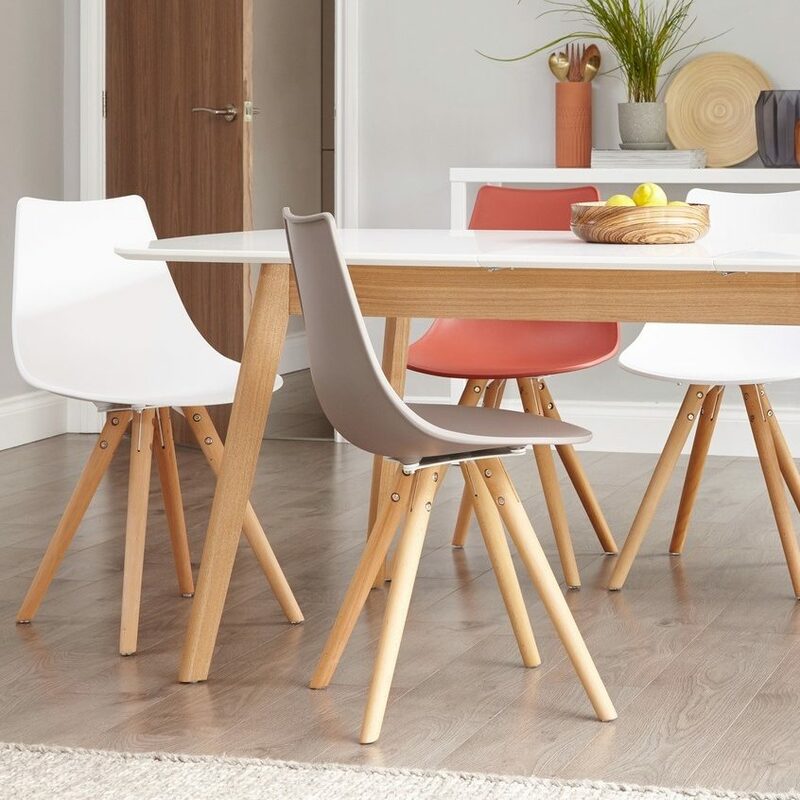 With so many choices and combinations available, we’ve also written two handy guides to help you choose the perfect dining chair and dining table which you can view (after you’ve finished reading here of course!). 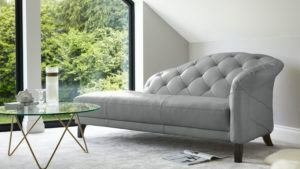 A sofa is something that will be used day in, day out. 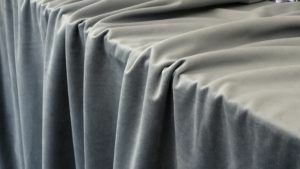 So you’ll want something as comfortable as it is durable. 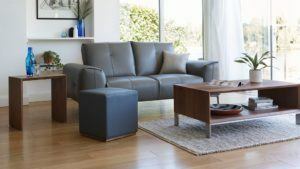 We have a whole variety of sofa sizes in fabric and real leather upholstery; there is sure to be a piece that is right for you and your family! 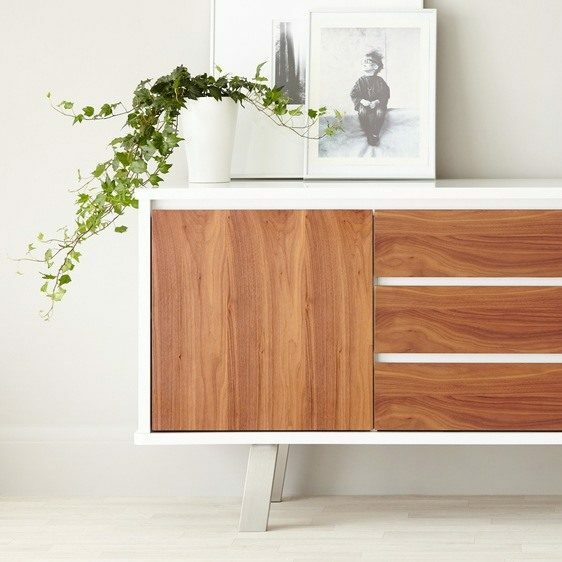 A sideboard is such a versatile piece of furniture. 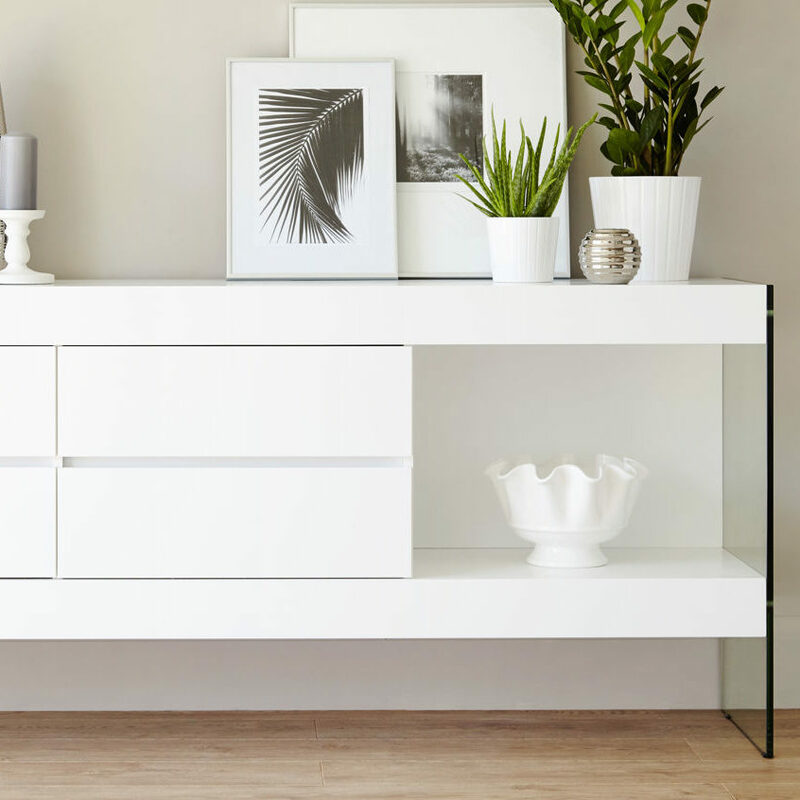 This is because it can be used for both styling and storage in a variety of rooms. 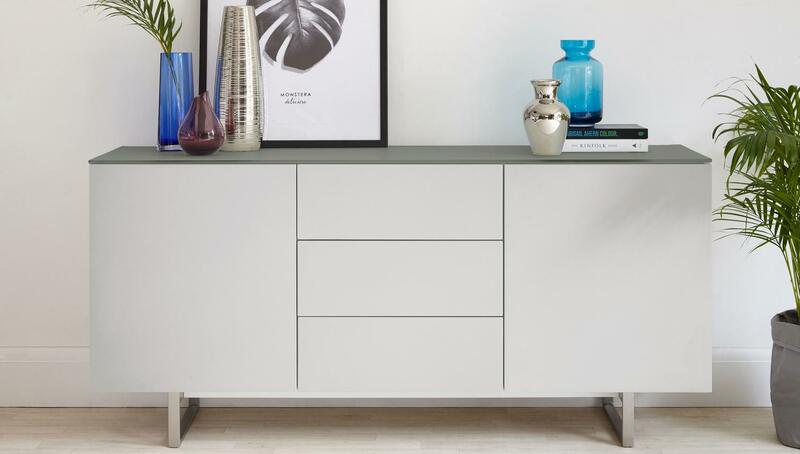 If you think you’ll be a little pushed for space, consider a compact sideboard as this will still offer a storage space that keeps items out of sight, without taking up too much space. 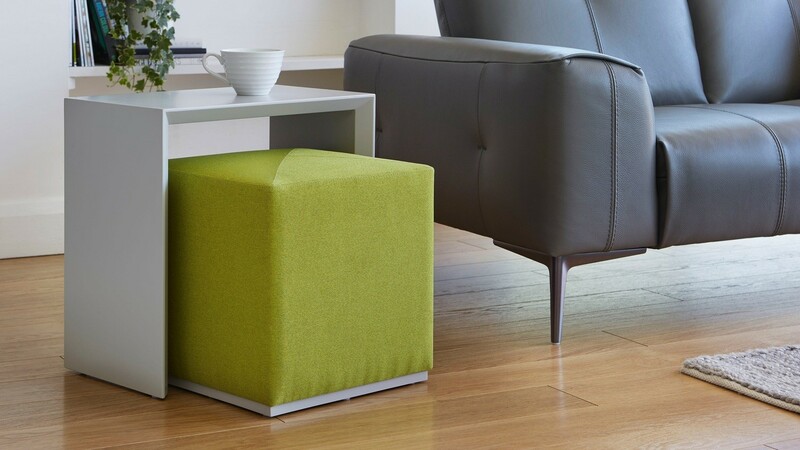 Make the most of your new living room by choosing a side table set that can be stacked when not in use. 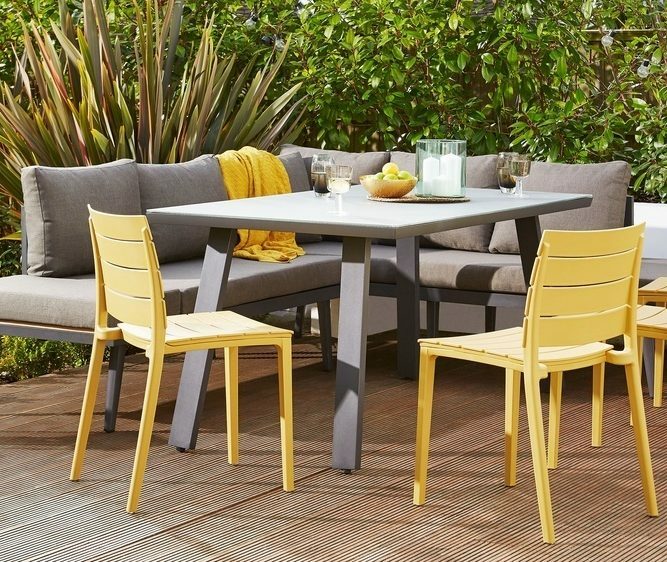 Or, consider a set that doubles up as a table and stool to offer a handy extra seat. 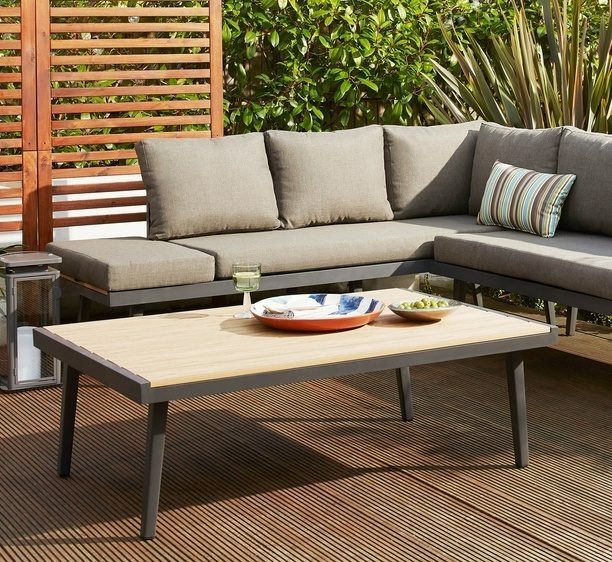 Our Tiva Coffee Table Set can be separated and styled to suit your space, and then stacked again when not in use making it great for a versatile living area. 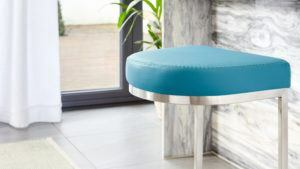 The Duo Matt Grey Side Table and Lime Fabric Stool Set doubles up as side table and stool which can be used as a footrest, surface for drinks and even a handy extra seat. 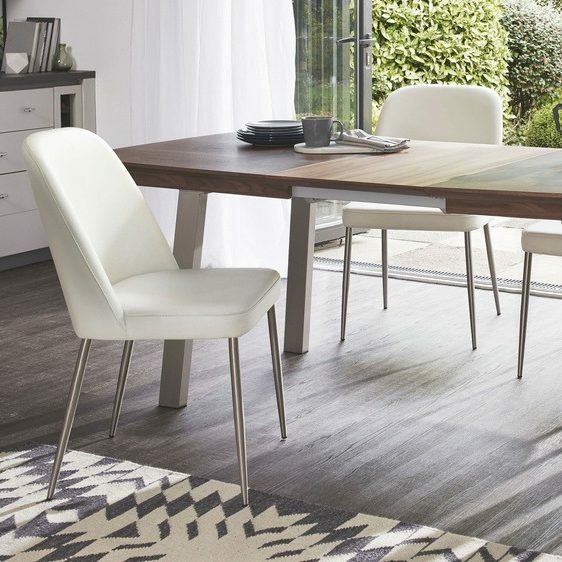 Make the most of your new space with an extending dining table. 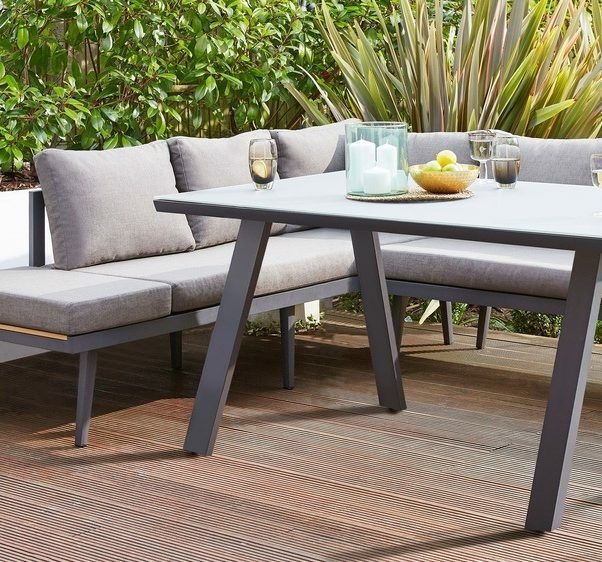 Sets like the Metro Grey Gloss and Finn Extending will mean that there's plenty of room for guests to pull up a seat during your house warming! 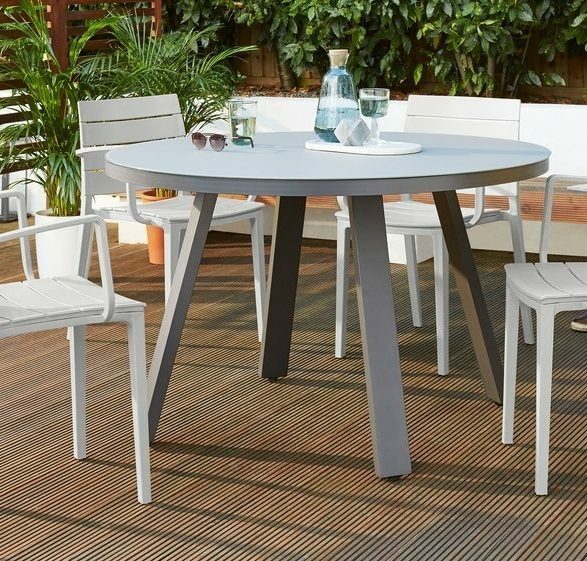 The Metro grey gloss dining table can extend from a four-seater all the way up to a ten-seater dining table. 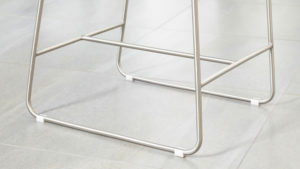 Save space with this table too, as the table extensions are stored within the table top. 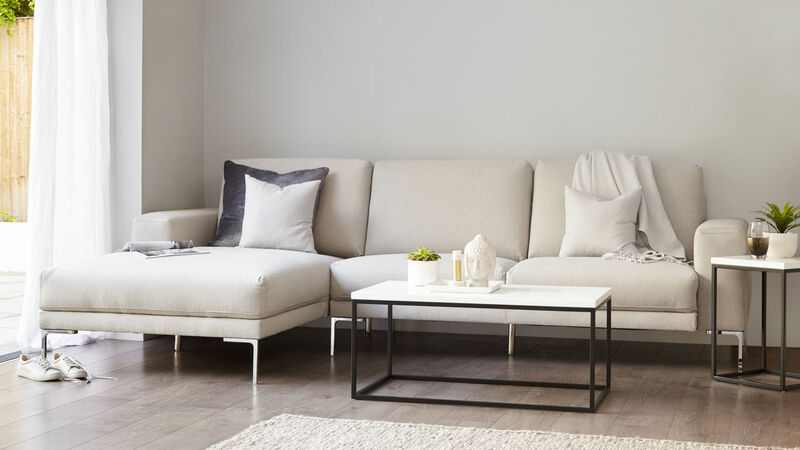 Starting out with a blank canvas such as a new home doesn’t mean that you have to buy everything matching to coordinate your space. One great way to tie your room together is through your use of colour. So if you already have a sofa but now have the space for a coffee table, consider your materials and colour scheme. This will help to seamlessly combine the pieces together. Create a welcoming living room setting by using real leathers and warm walnut finishes. 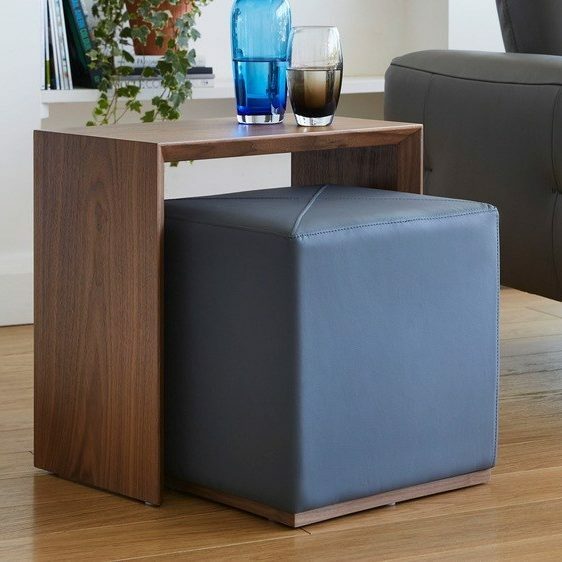 Here we’ve coordinated the Duo Walnut Side Table and Graphite Grey Stool Set with the Halo Walnut Coffee Table. 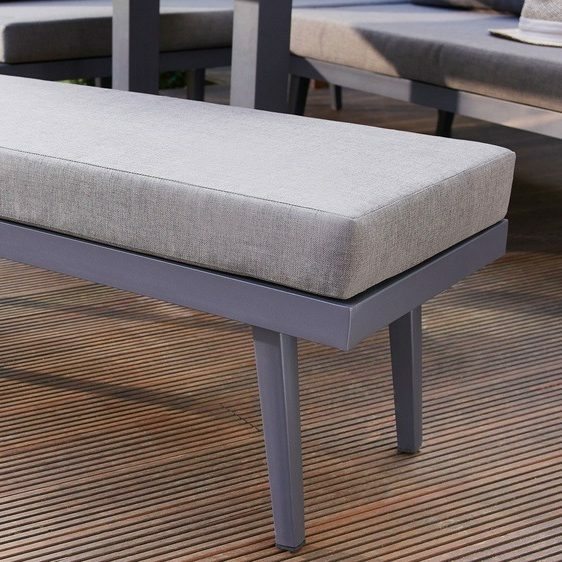 The grey leather stool also coordinates with the grey Dillon sofa (even though the greys are a slightly different shade). 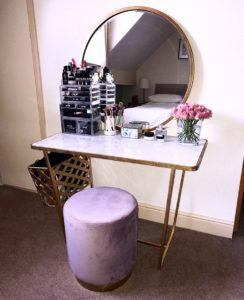 This is a great example of how you can tie different furniture together with the use of textures and colours. 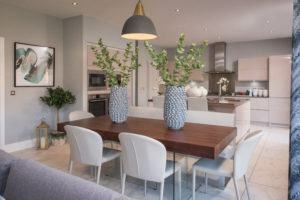 Many new builds will have a very neutral interior. 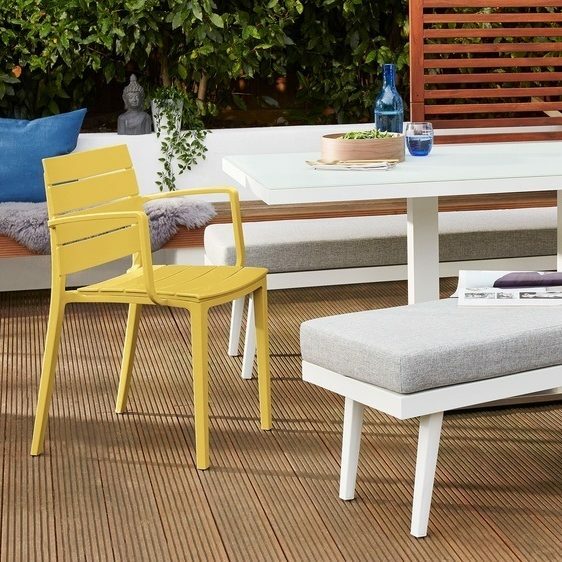 So if you want to inject some colour into your space but don’t have the time or money to go all out on your decor, be clever with your furniture choice colours, such as colourful dining chairs or a bold coloured sofa set. 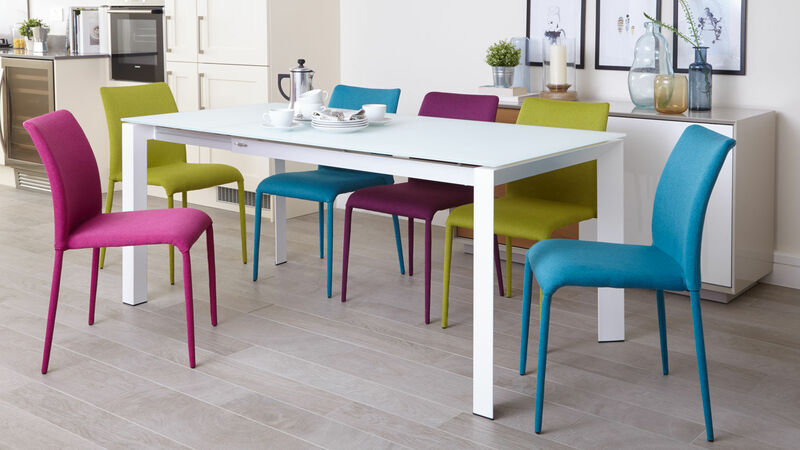 Colourful dining chairs, like our Riva range, are a great way to add a stylish pop of colour to your new dining area. You colour choice of sofa can have a big style impact on the rest of your living room. 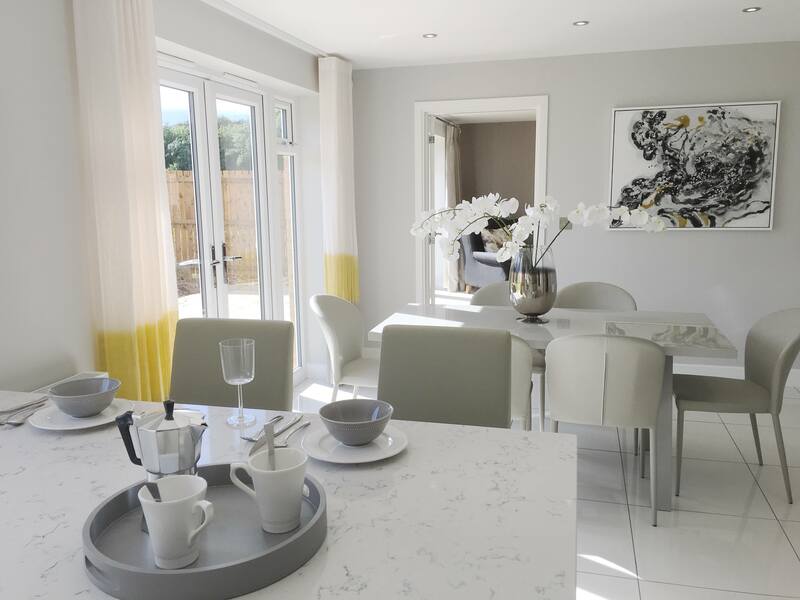 The neutral scheme of many new build homes is a great opportunity to be bold with your colour choices. 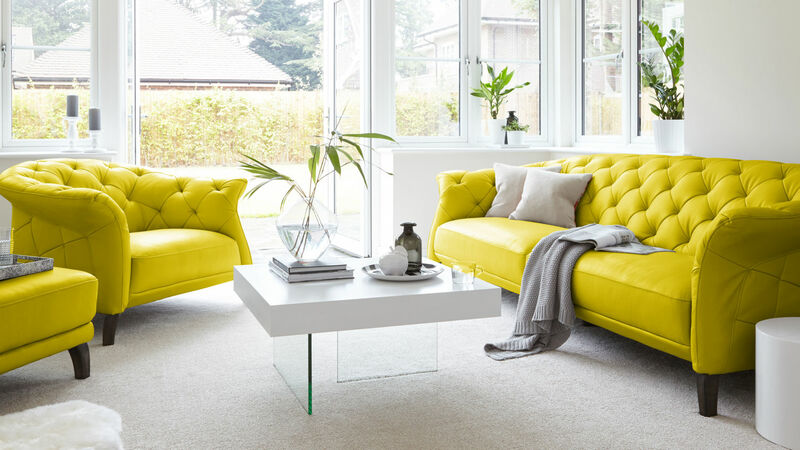 Our Luxe sofa in mustard yellow is a great example of how to inject some colour into a more neutral space. 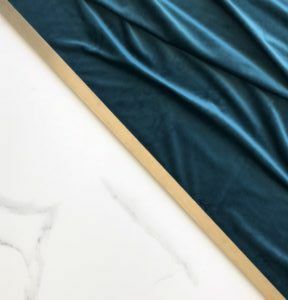 With our free swatch sample service, it’s easy to order a couple of samples to get a flavour for your colour palette and material choices. The glossy interior magazines do look stunning. However, sometimes the best styling inspiration can come from real homes. 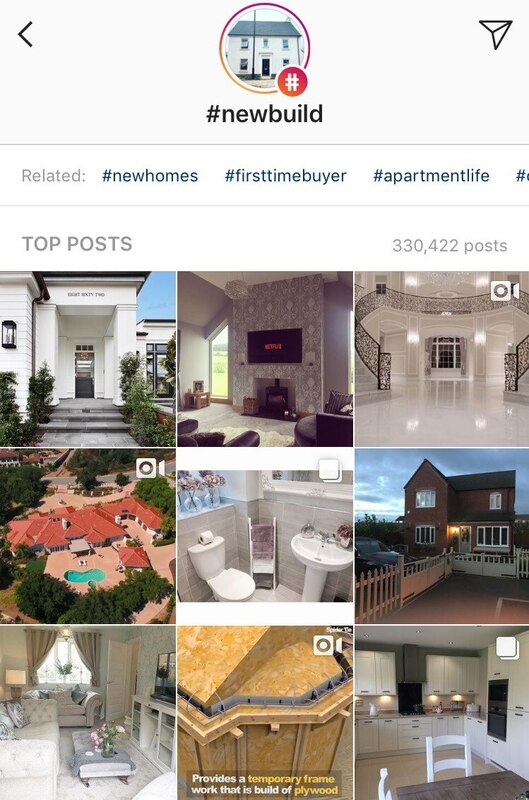 There's a whole community of new homeowners sharing their design journey on social media platforms such as Instagram and Houzz, so be sure to follow people in the community. #newhome, #newbuild and #firsttimebuyer are great hashtags to get started. Then you'll start to discover accounts that you love! You can also use the platforms to ask questions and even share some of your own knowledge. This can be invaluable when moving into a new home. Start off by searching for relevant hashtags. This way you'll find relevant accounts and people to follow. Along with sharing the journey, many people like to showcase the finished look! We ask our customers to use #mydanetti when they snap their homes so we can see the finished results. 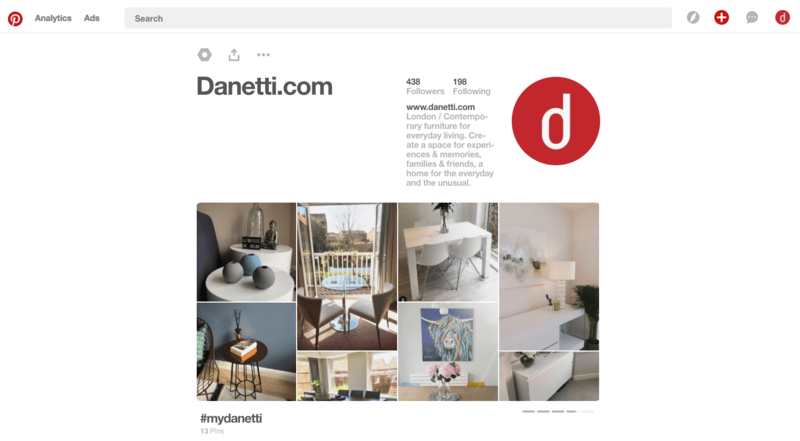 Here are a couple of our favourite customer images, but remember, you can view loads more if you search #mydanetti on both Facebook and Instagram. 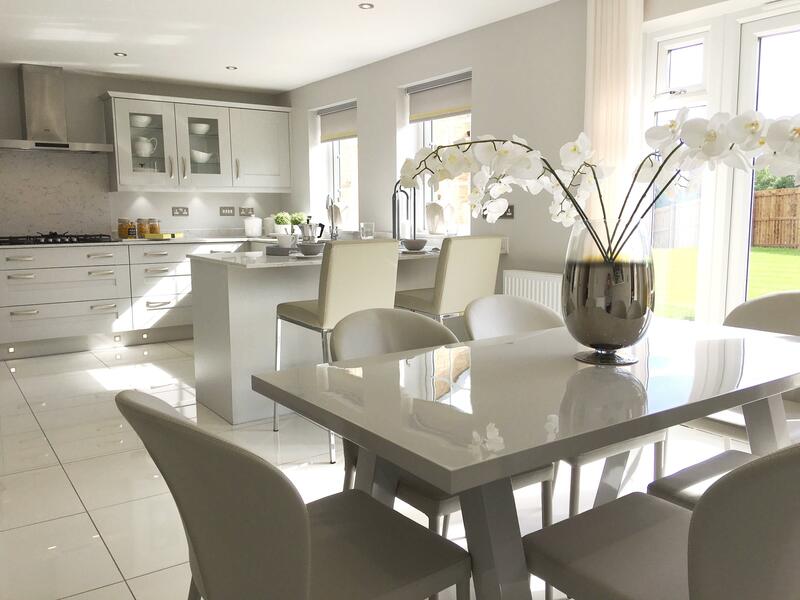 Louise has really made the most of this stunning open plan kitchen and dining area. 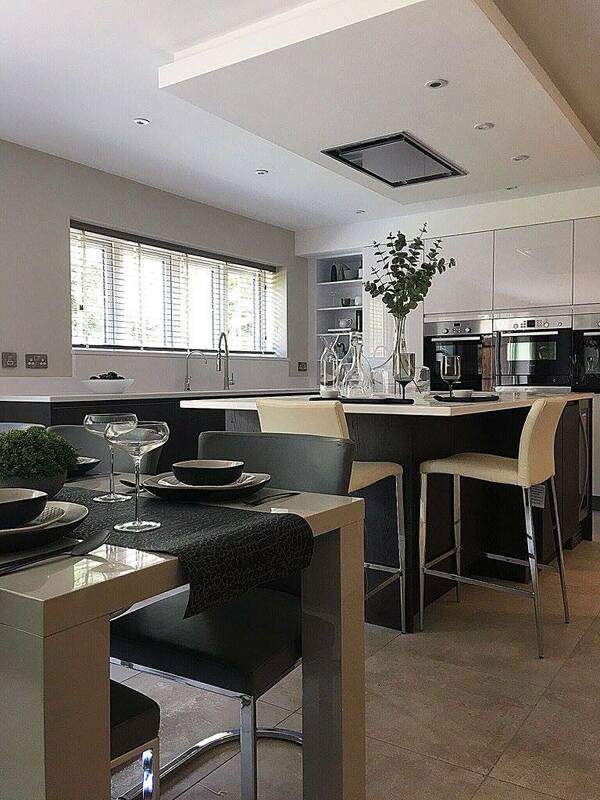 Here she has styled the Elise Bar Stools, Santo Dining Chairs and Zen Grey Gloss 6 Seater Dining Table. 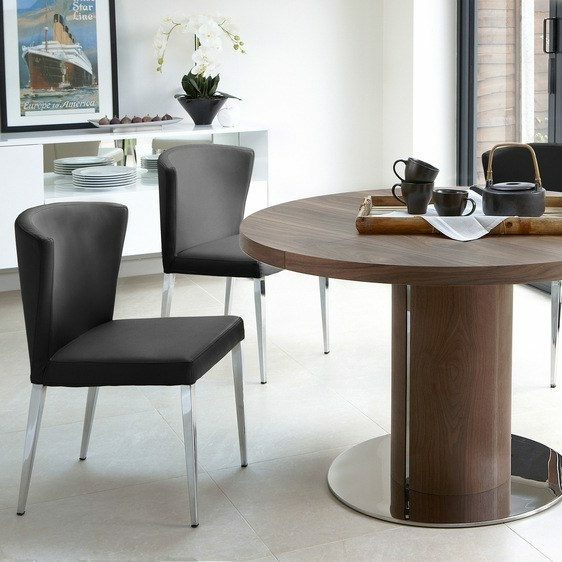 Michaela has truly perfected a modern loft living look with the help of our Fern White Gloss Extending Dining Table! Here Pip has shown how you coordinate the right way! 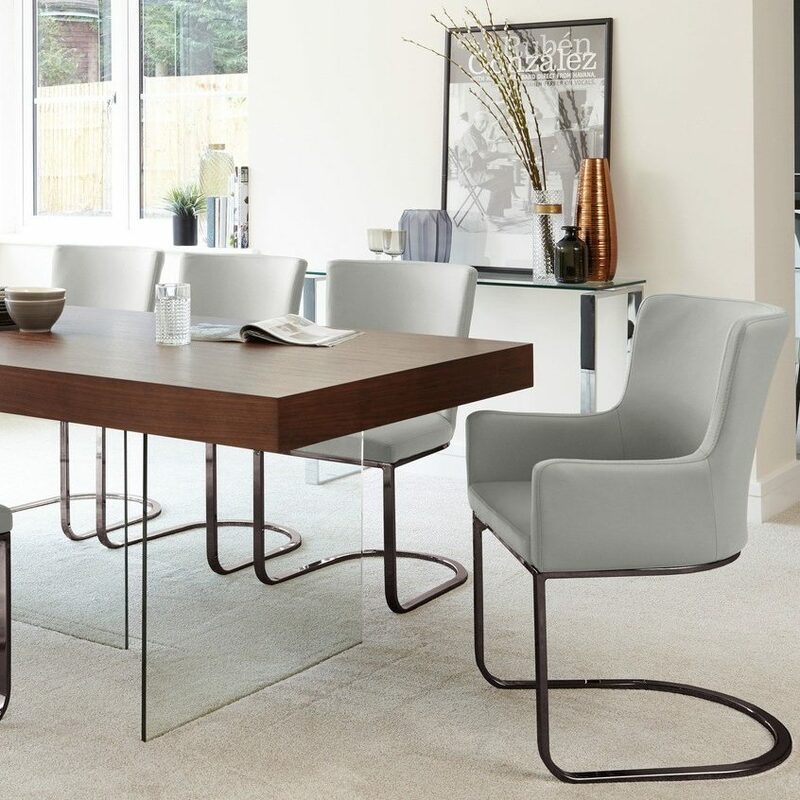 Matching our Form Cantilever Dining Chairs with the Elise Bar Stools and Fern Grey Gloss 6 Seater Dining Table is definitely a winning combination. And most importantly- have fun! 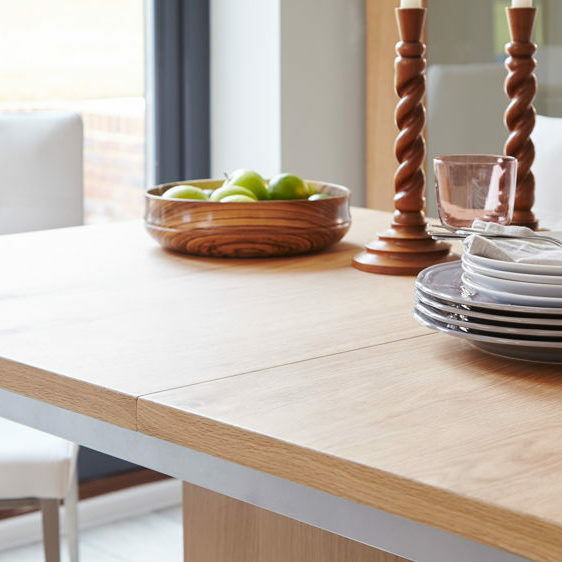 Moving into a new home does have its worries and stresses, but make sure you take a moment to think of the home you’re creating for you and your family; it’s a space to make new memories during mealtimes, Christmas dinners, and snuggling up on the sofa. We hope this post gives you a bit more guidance on how to furnish a new build home. If you have any questions or have just moved and want to share some of your new build experiences, be sure to let us know in the comments. We love seeing how our customers set up and style their Danetti pieces in their home. If you’ve just moved and furnished your new place with some Danetti flair, be sure to share a picture on Facebook and Instagram with the #mydanetti for your chance to be featured on our page!